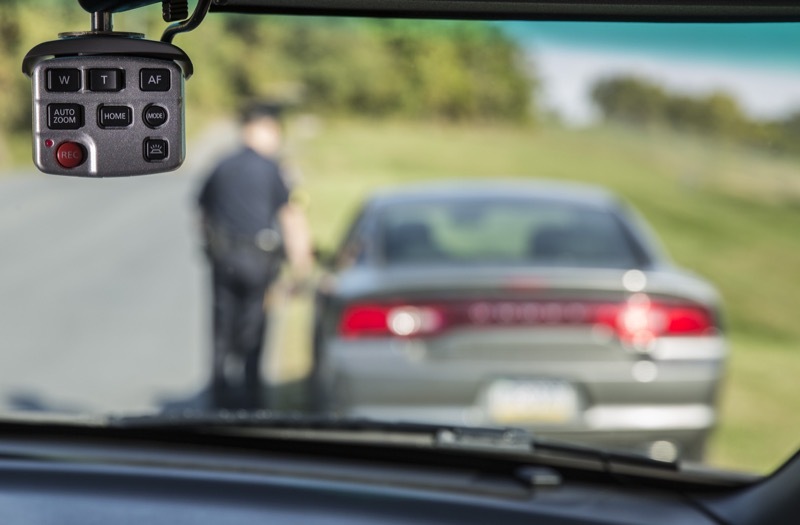 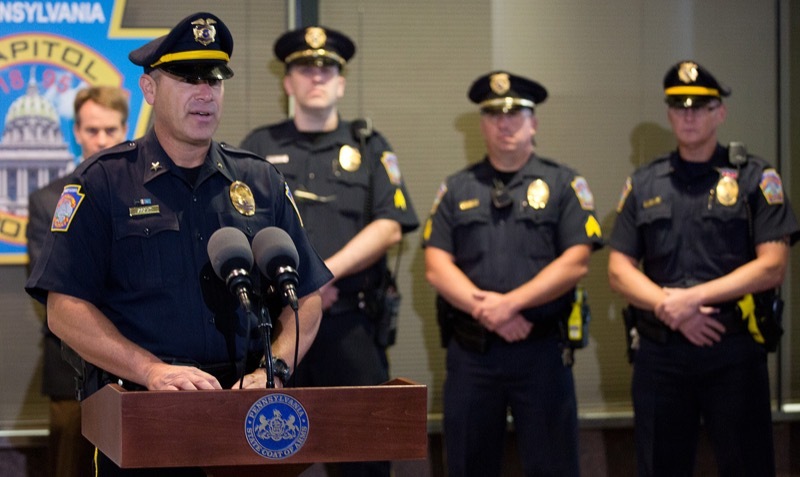 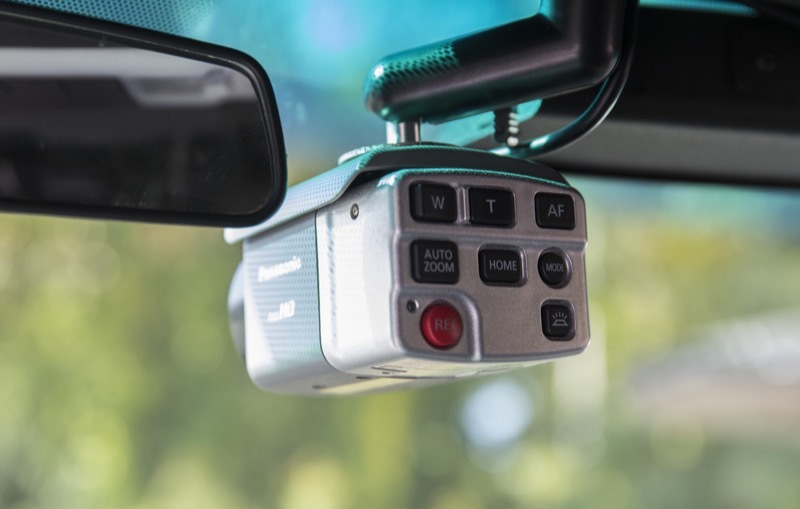 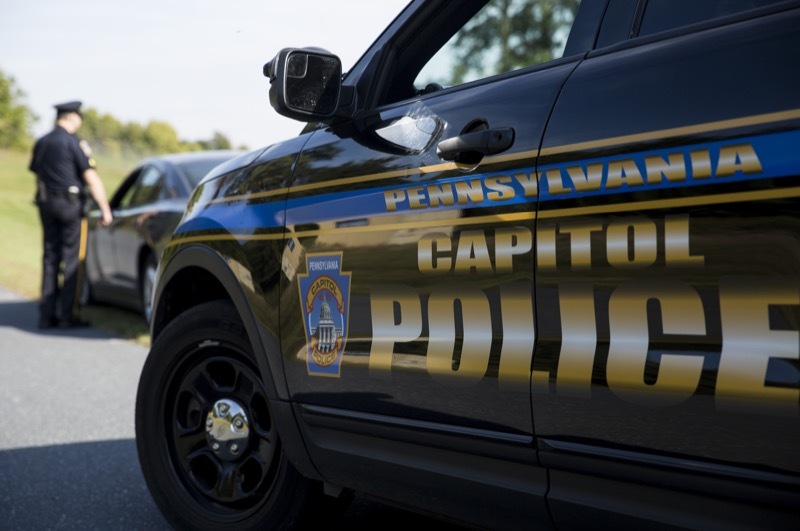 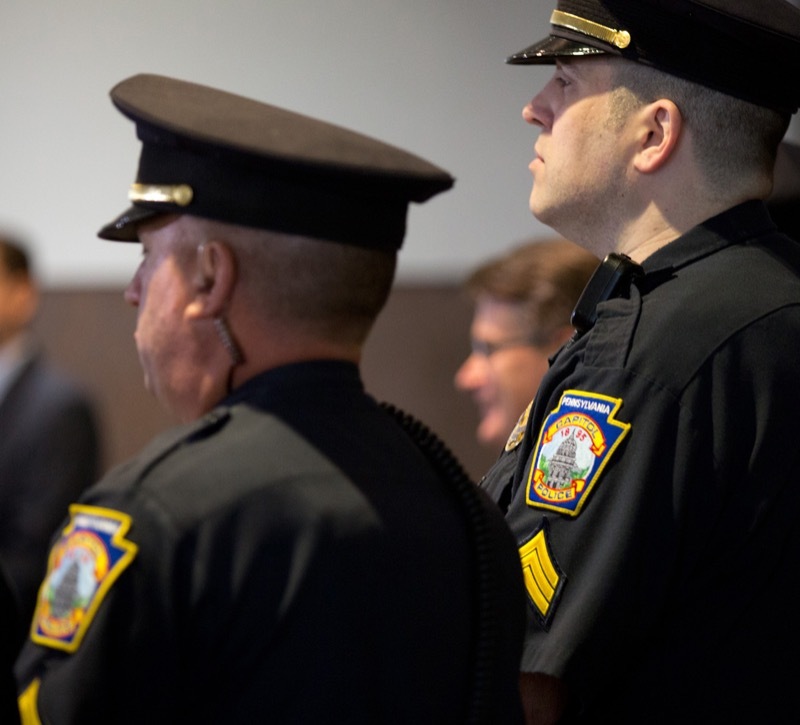 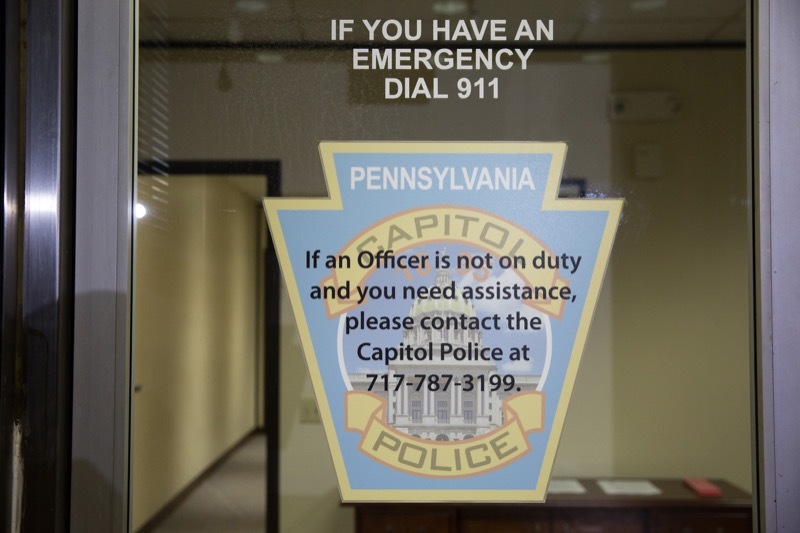 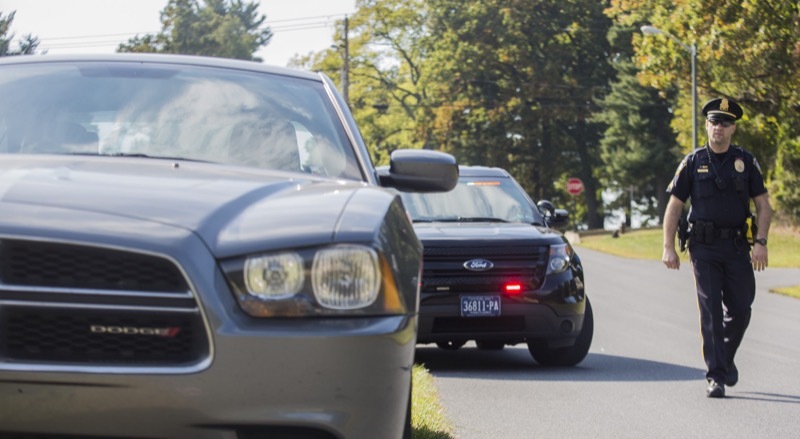 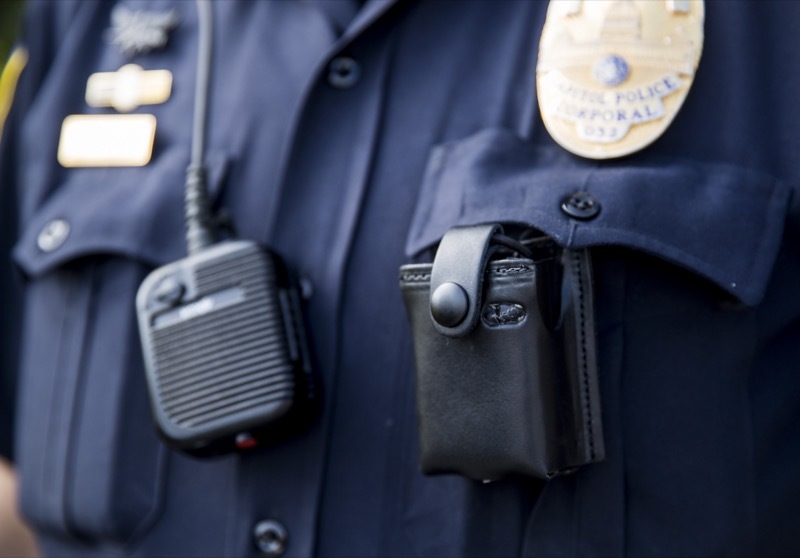 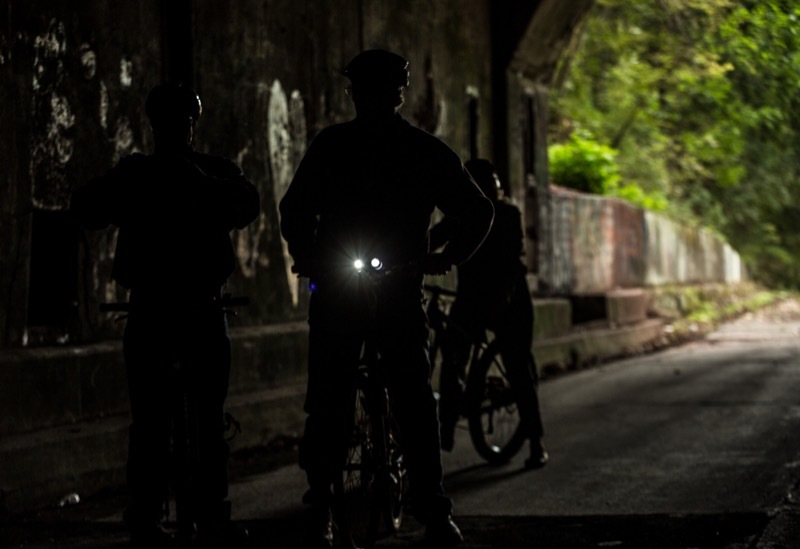 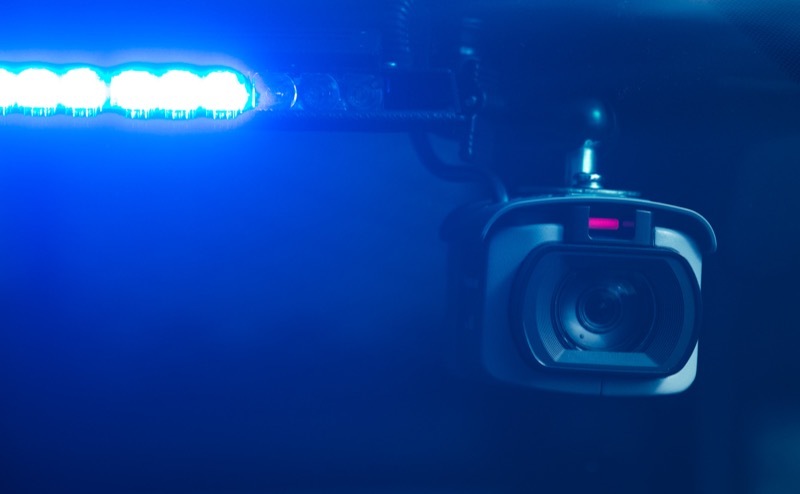 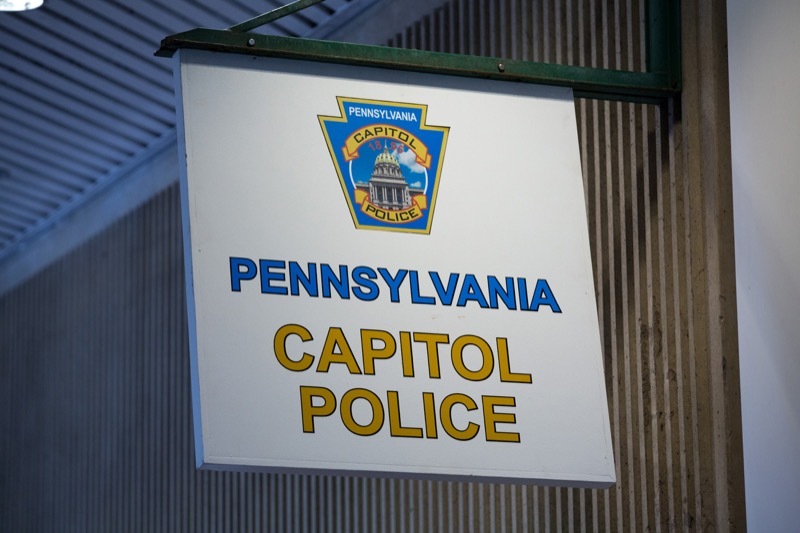 Pennsylvania Capitol Police Superintendent Joe Jacob today announced the police force has recently upgraded its patrol vehicles with in-car camera technology that will provide an audio and video recorded account of all officer traffic stops and other interactions with the public involving patrol vehicles. 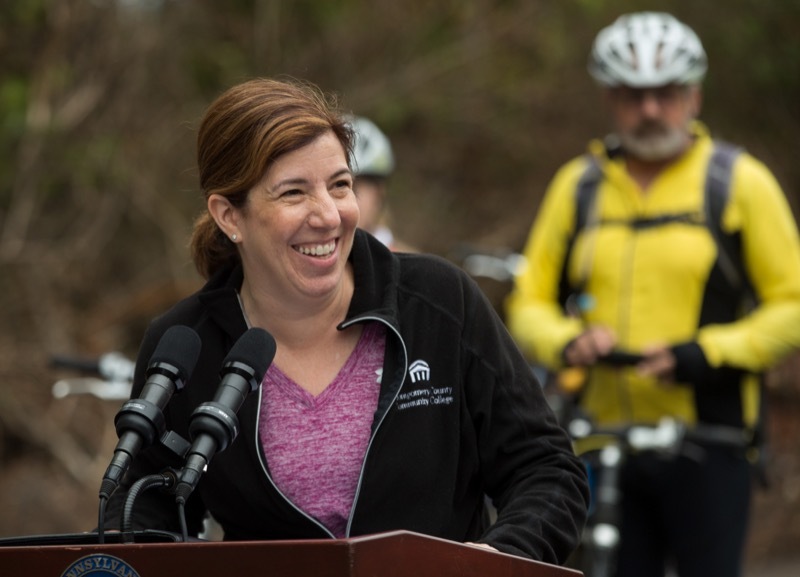 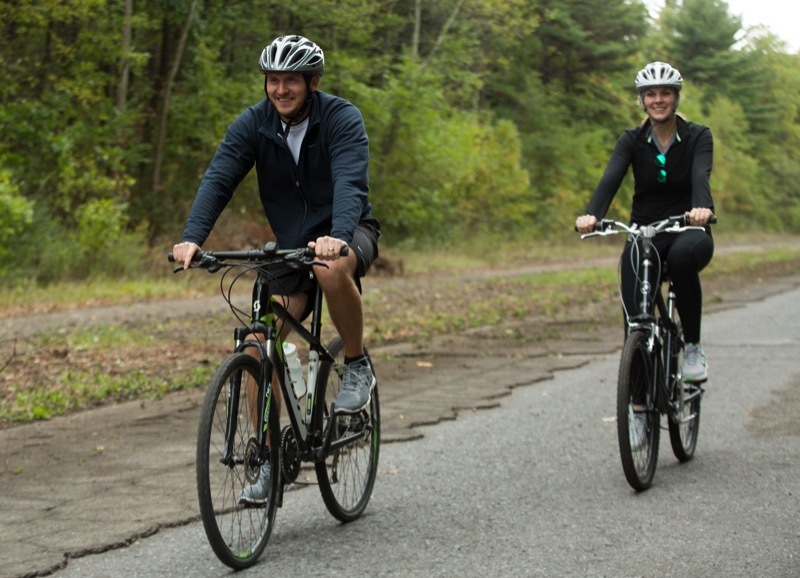 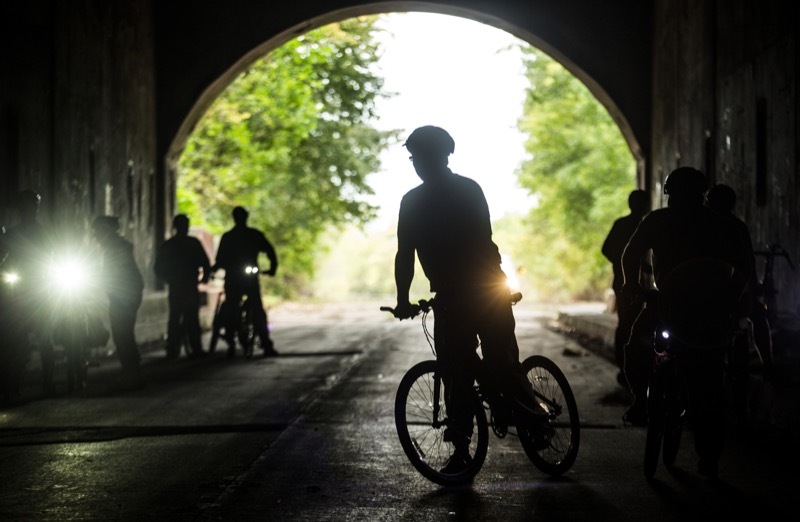 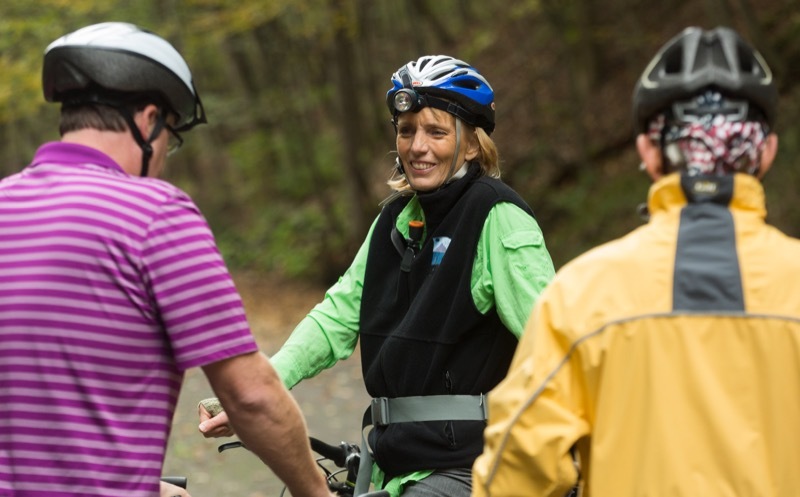 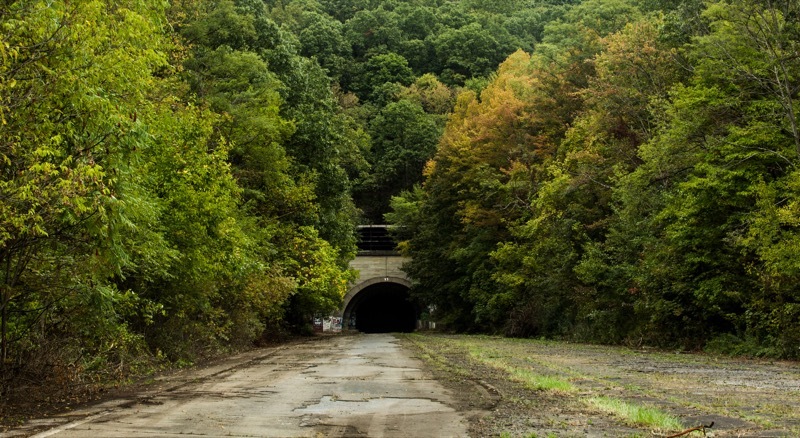 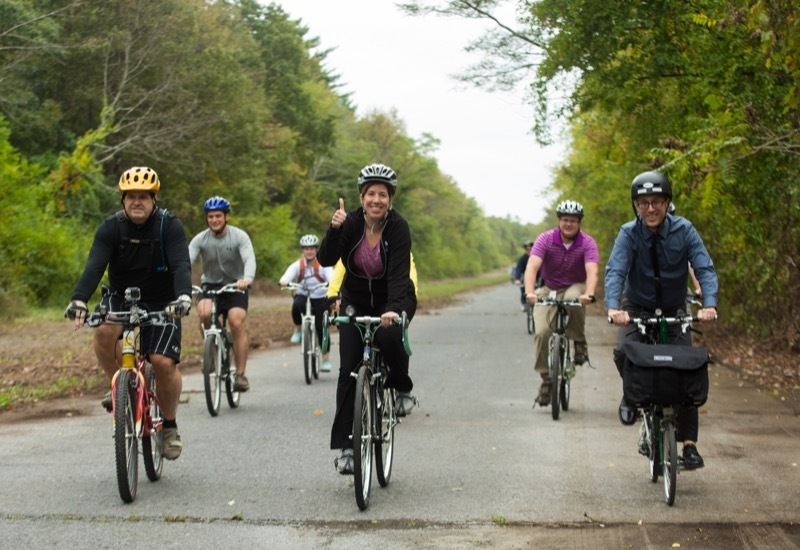 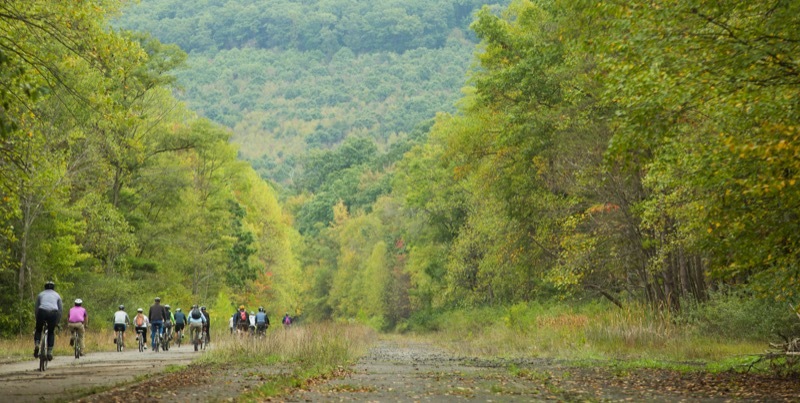 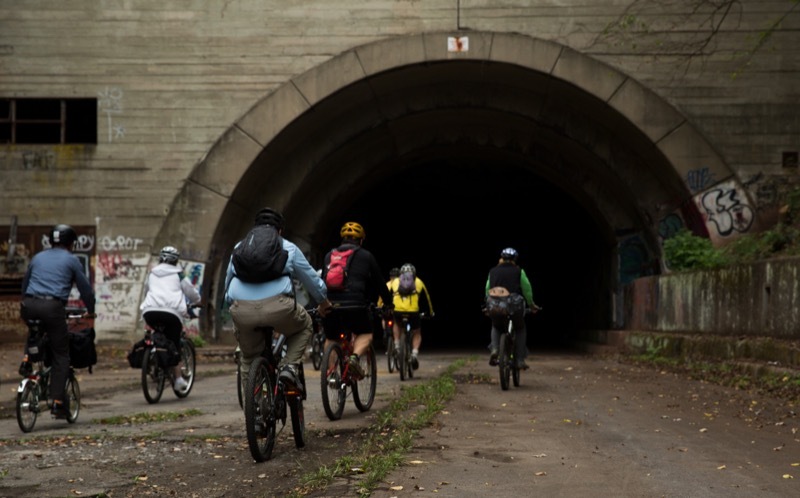 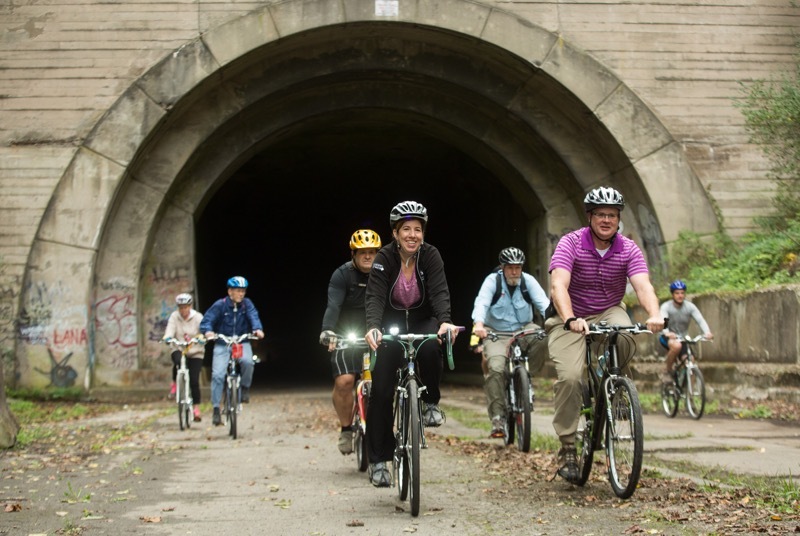 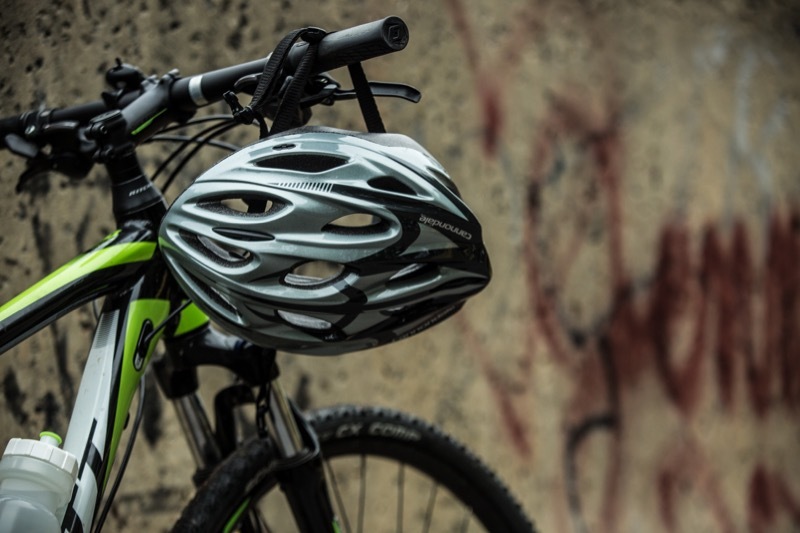 Pennsylvania Department of Transportation (PennDOT) Secretary Leslie S. Richards, along with the Department of Conservation and Natural Resources (DCNR) Secretary Cindy Dunn, today jointly rode the proposed Pike2Bike trail in Bedford and Fulton counties, which uses the former right of way of the Pennsylvania Turnpike. 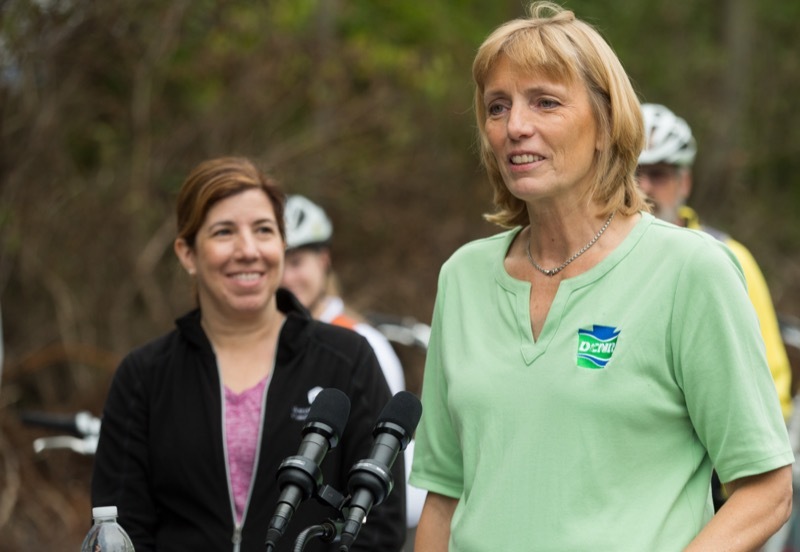 Harrisburg - Pennsylvania Department of Transportation (PennDOT) Secretary Leslie S. Richards, along with the Department of Conservation and Natural Resources (DCNR) Secretary Cindy Dunn, today jointly rode the proposed Pike2Bike trail in Bedford and Fulton counties, which uses the former right of way of the Pennsylvania Turnpike. 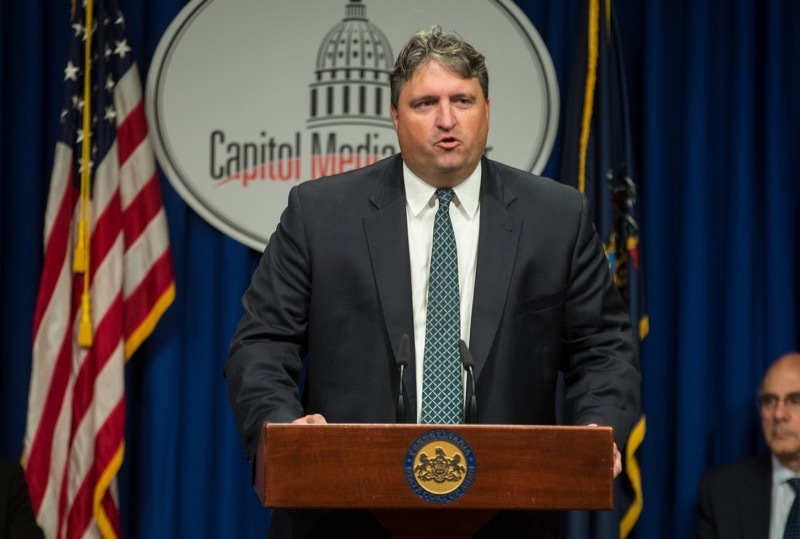 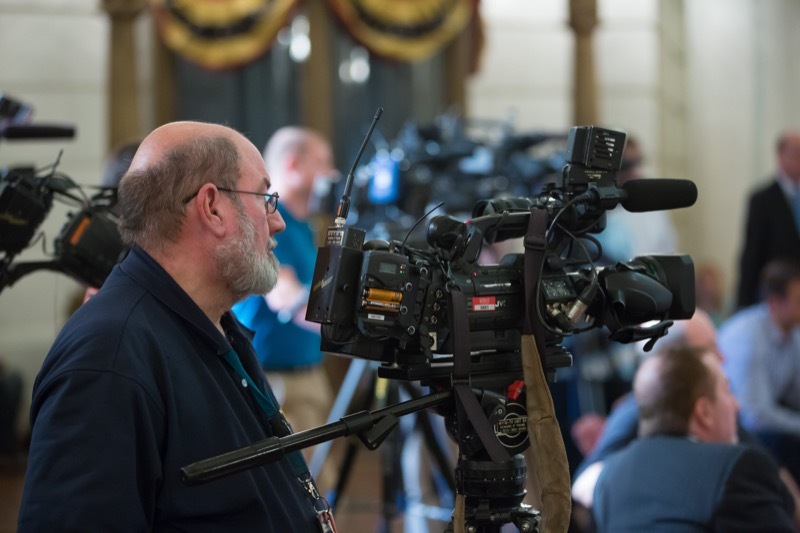 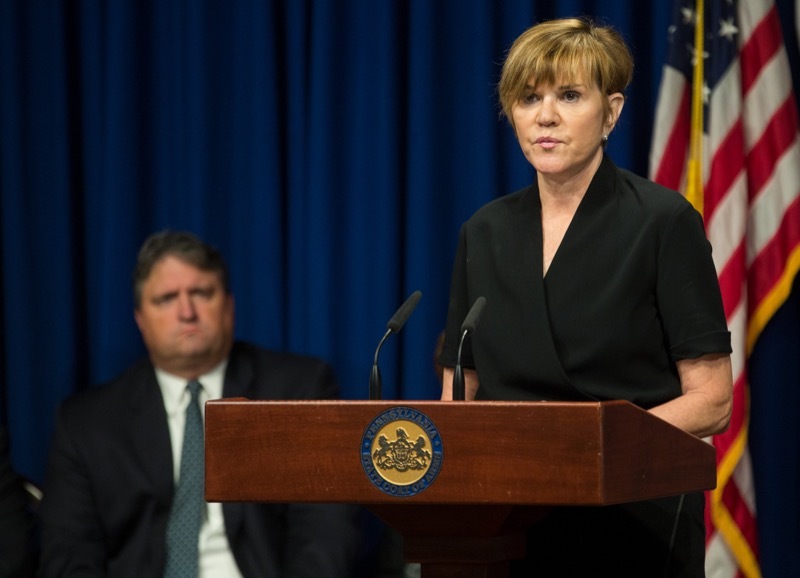 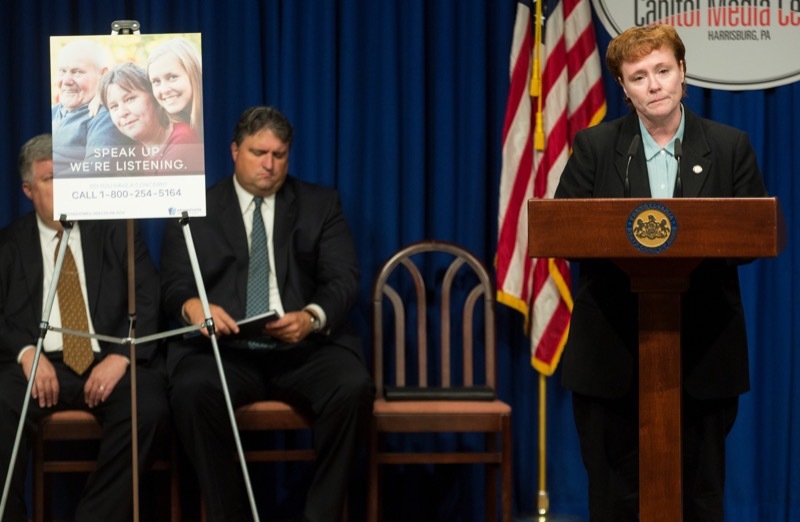 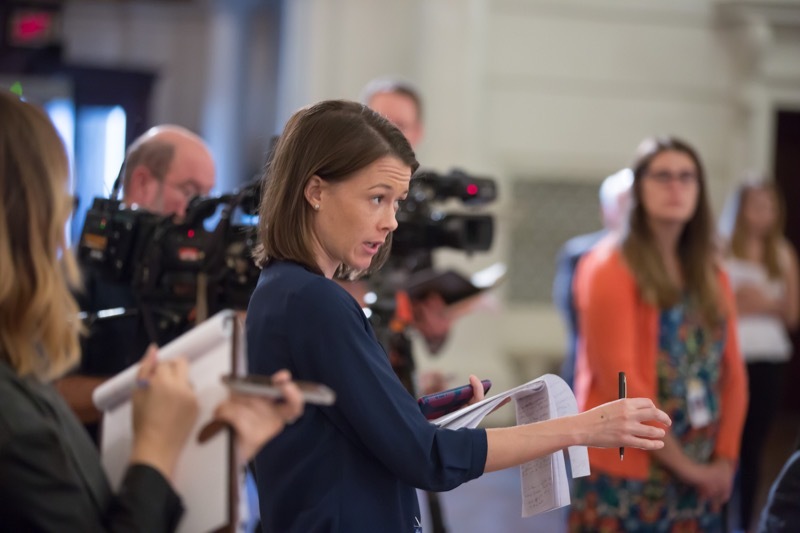 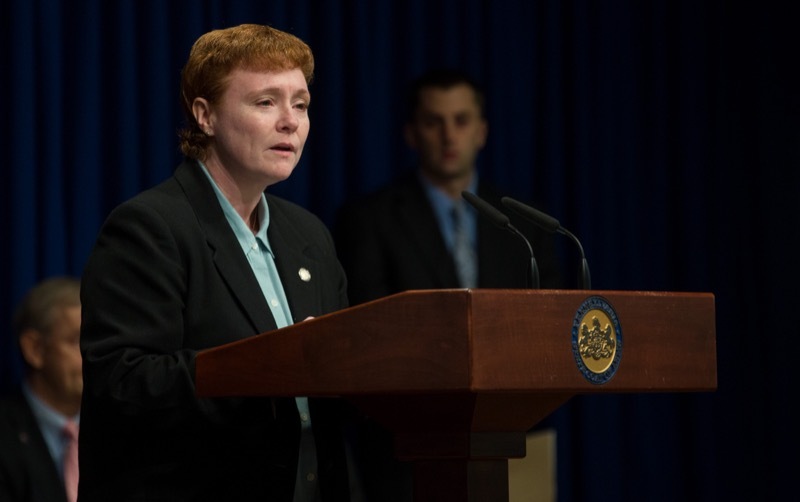 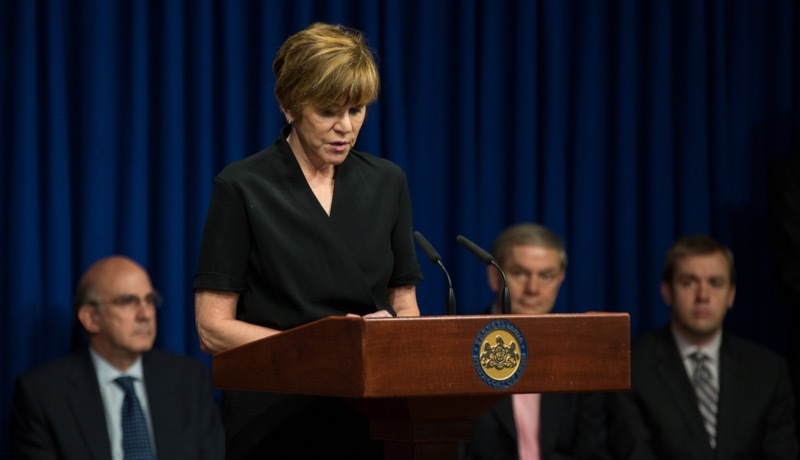 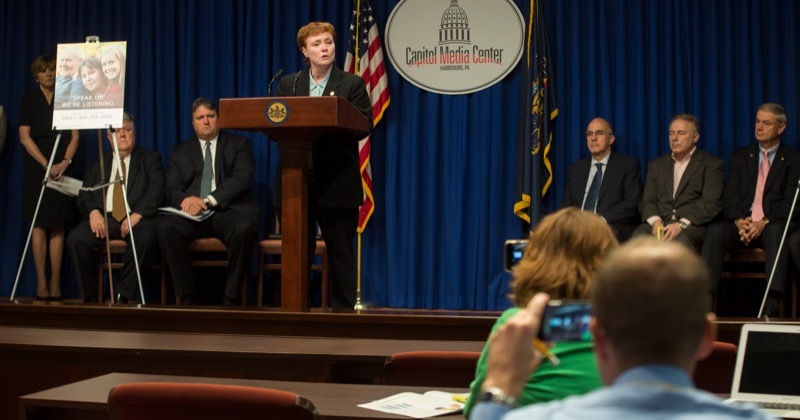 Pennsylvania Department of Health Secretary Dr. Karen Murphy will release the recommendations of the Nursing Home Quality Improvement Task Force in a press conference at the Media Center in the State Capitol. 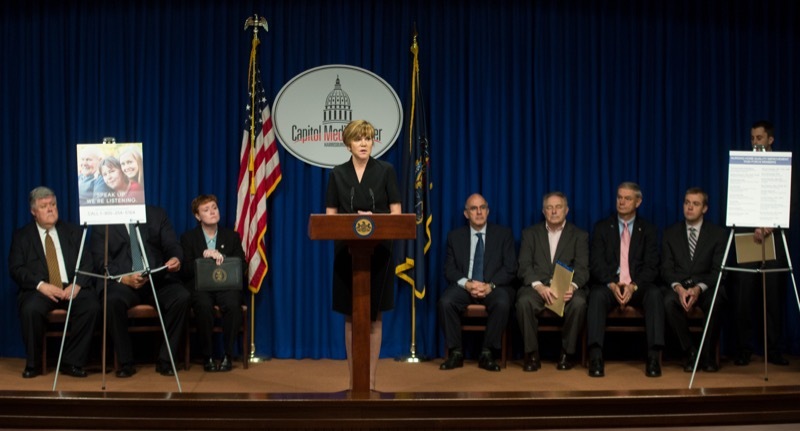 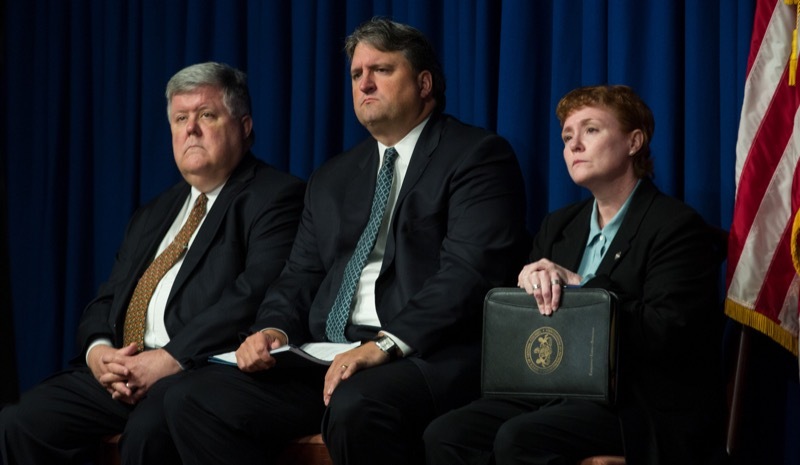 Harrisburg, PA - Pennsylvania Department of Health Secretary Dr. Karen Murphy today released the recommendationsof the Nursing Home Quality Improvement Task Force. 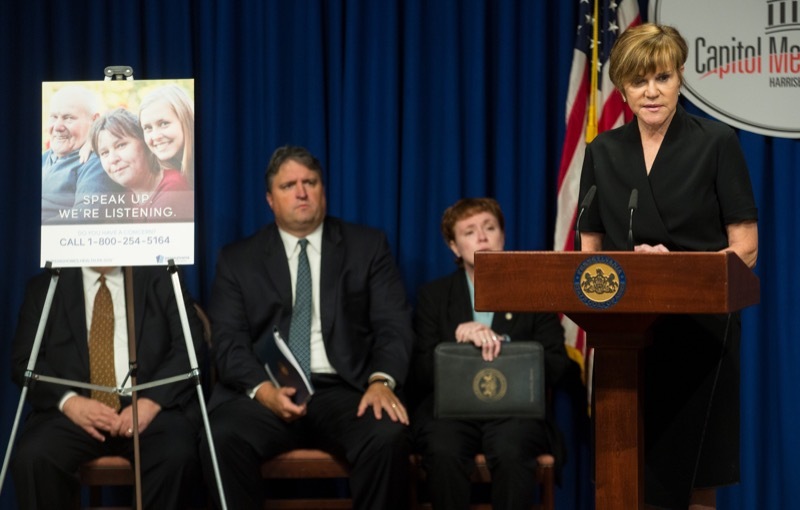 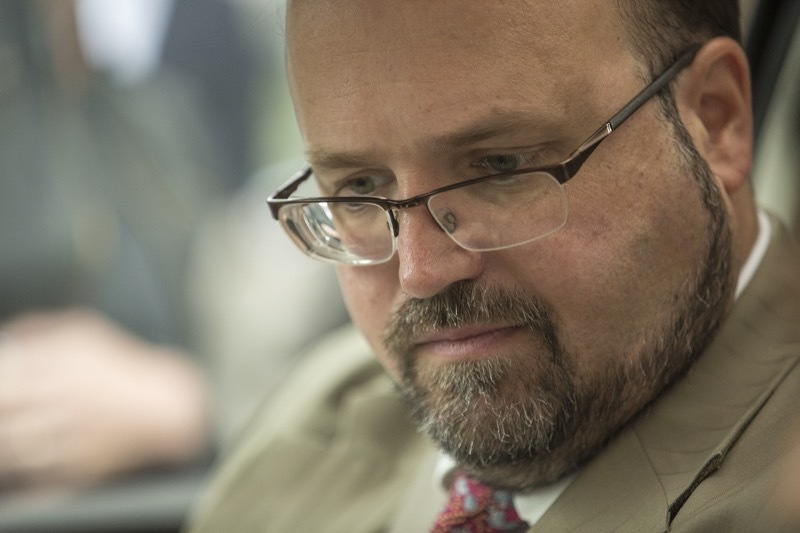 The task force was created as part of the department's proactive efforts under the Wolf Administration to make the most significant changes to nursing home oversight in nearly two decades. 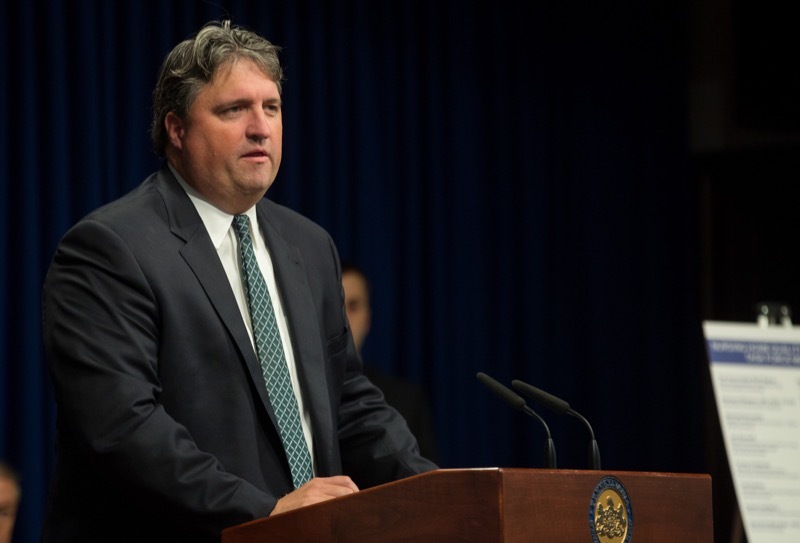 Secretary Murphy also announced the Office of Attorney General is providing $1.2 million to help facilitate the recommended changes. 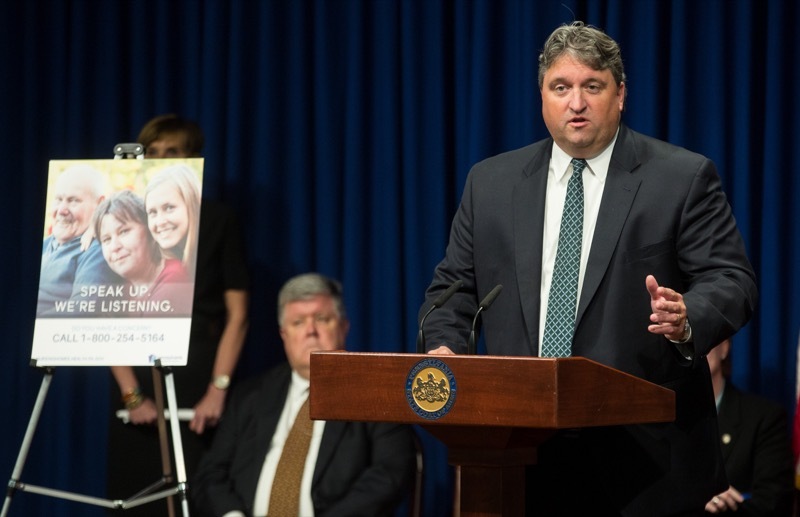 Today, medical providers from across Pennsylvania came together with people in recovery from the disease of addiction to discuss ways the healthcare system can more effectively treat addiction. 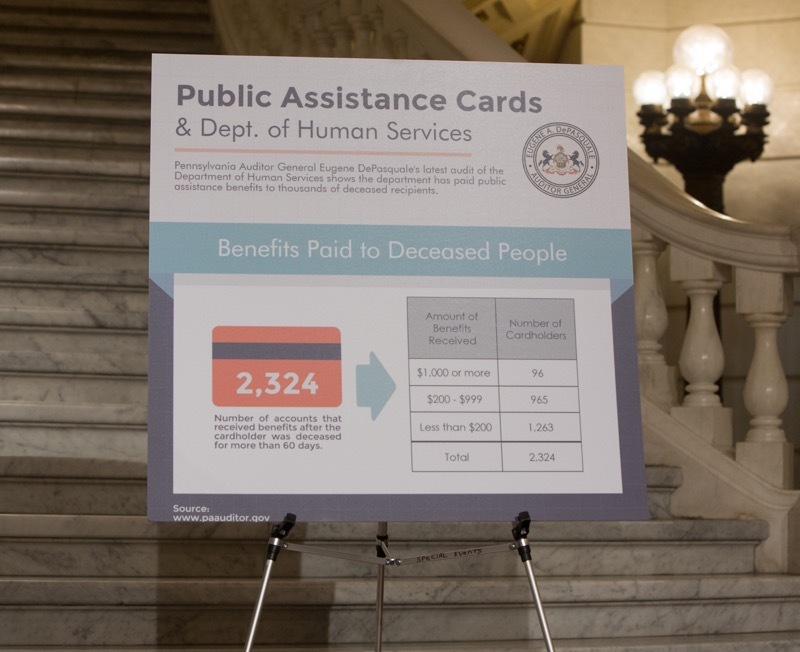 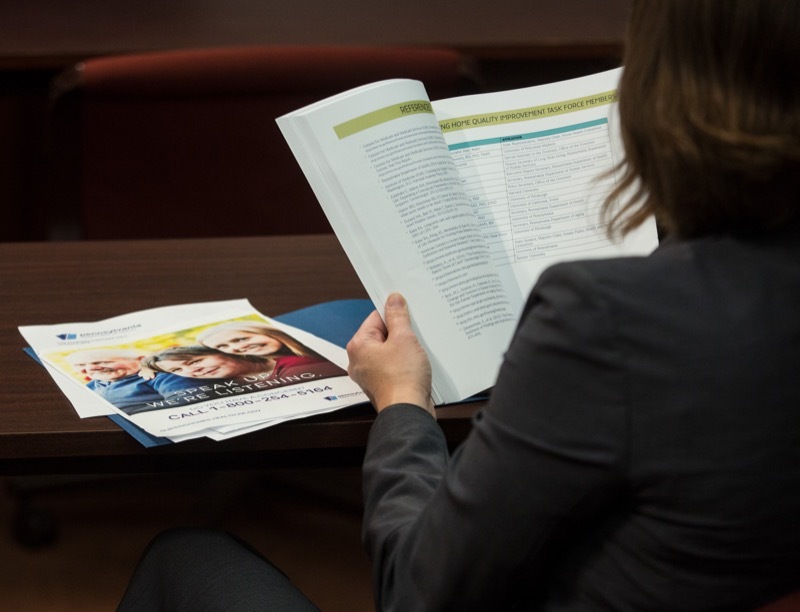 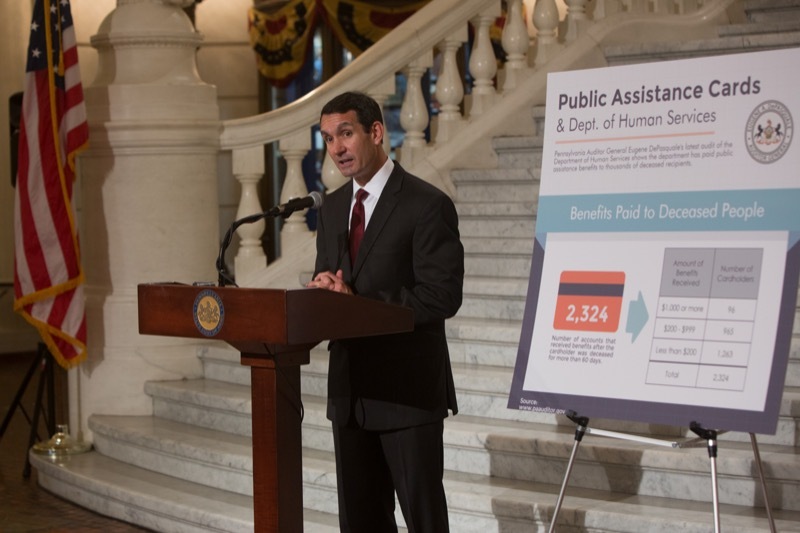 Auditor General Eugene DePasquale today said his latest audit shows that over a 12-month period the Department of Human Services (DHS) paid public assistance benefits to 2,324 deceased Electronic Benefits Transfer (EBT) cardholders' accounts. 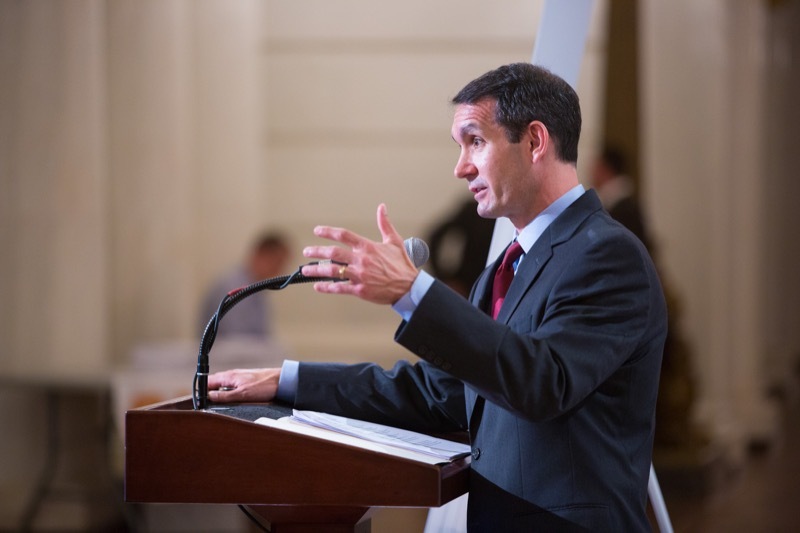 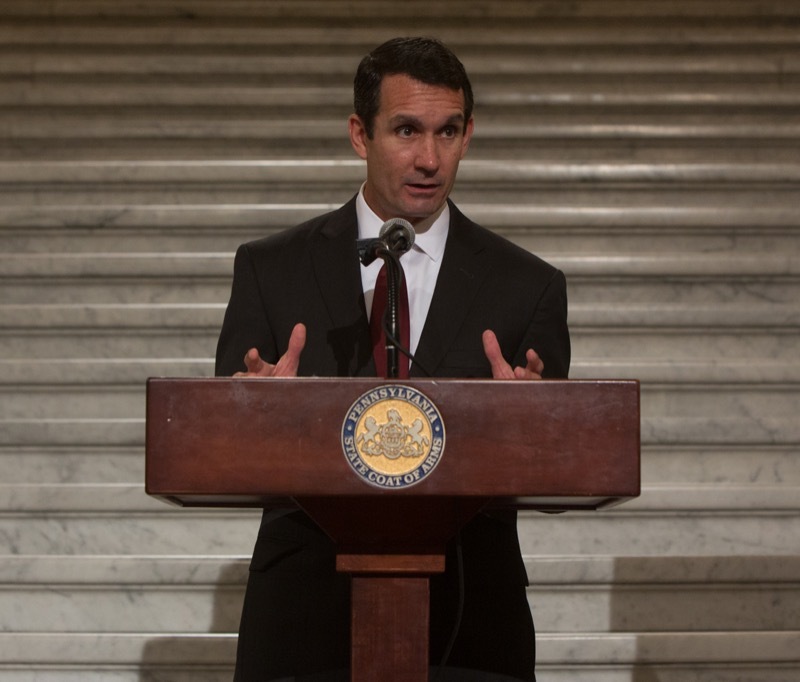 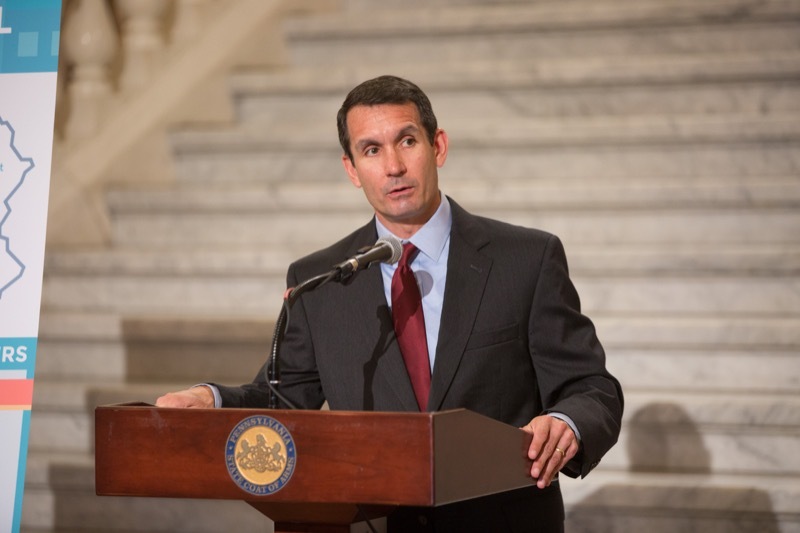 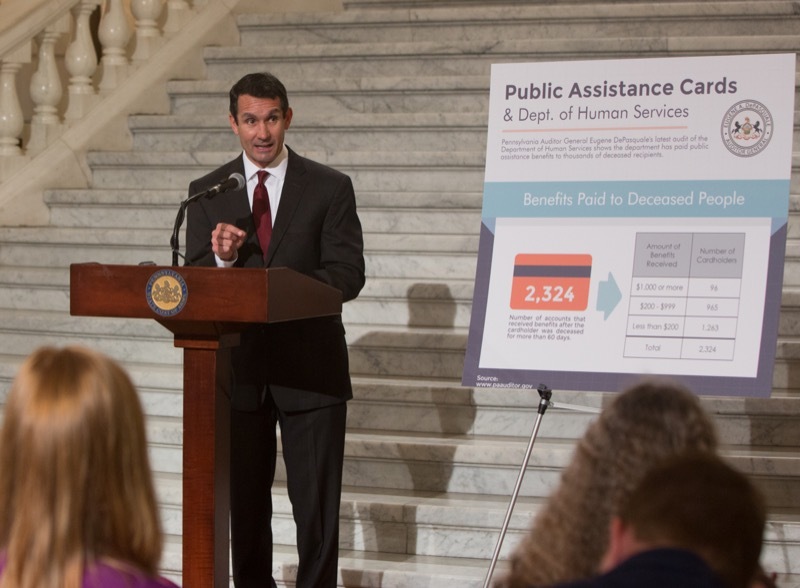 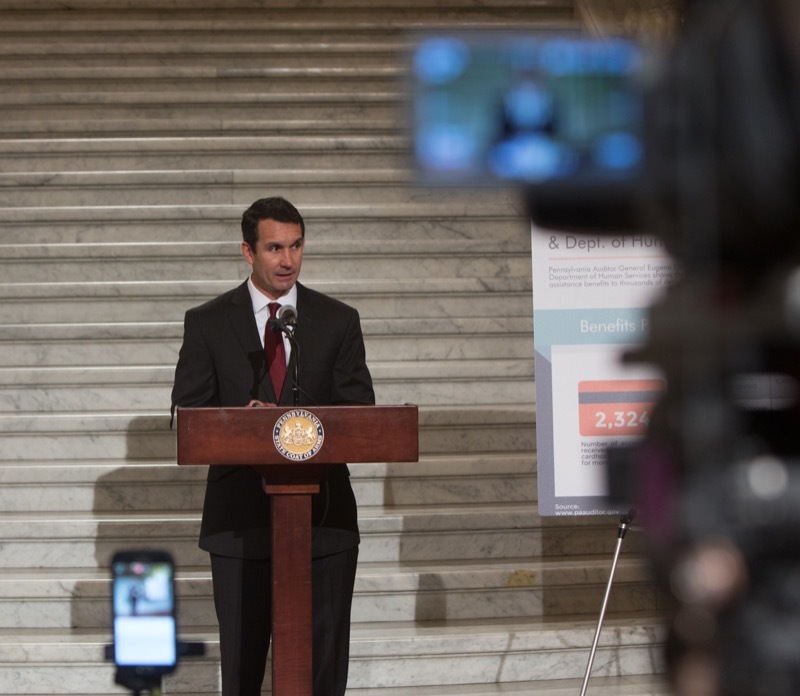 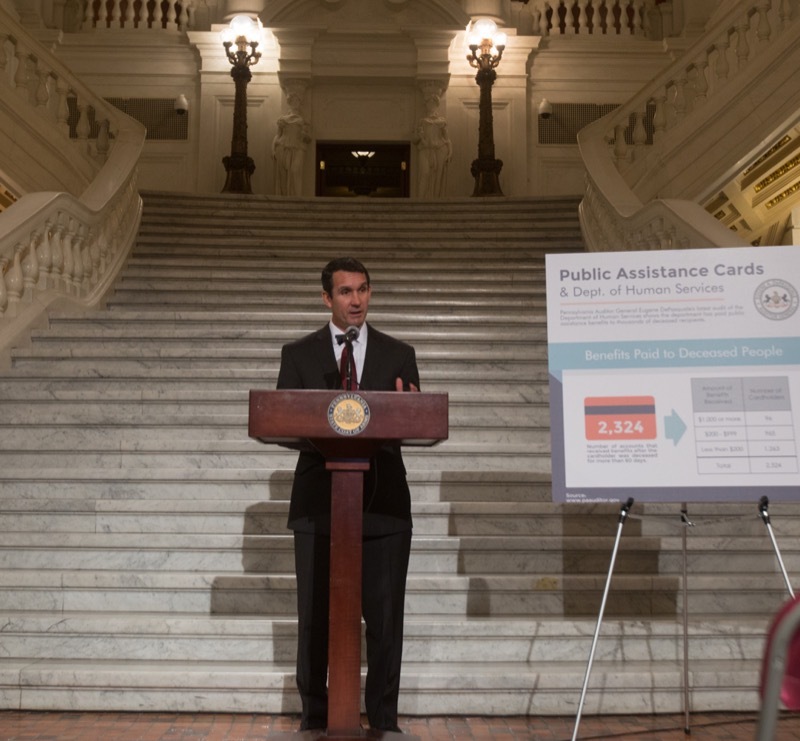 HARRISBURG - Auditor General Eugene DePasquale today said his latest audit shows that over a 12-month period the Department of Human Services (DHS) paid public assistance benefits to 2,324 deceased Electronic Benefits Transfer (EBT) cardholders' accounts. 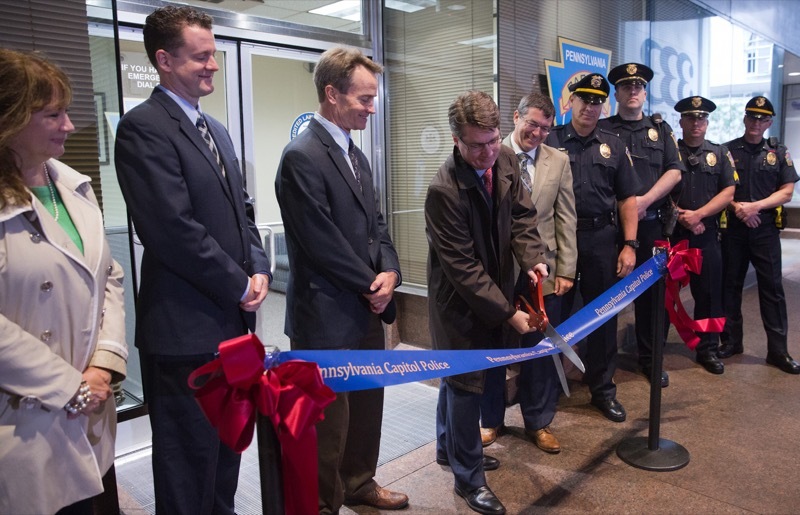 Harrisburg, PA - State Department of General Services Secretary Curt Topper and Pennsylvania Capitol Police Deputy Superintendent Kevin Brown were joined by Bradley Jones, CEO and President of Harristown Enterprises Inc., to officially open a new Pennsylvania Capitol Police Substation at 333 Market Street in Harrisburg. 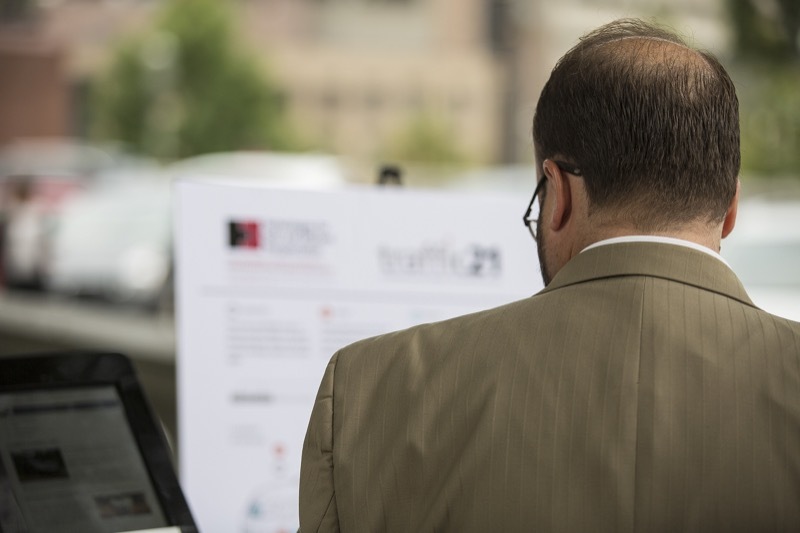 The new location will allow the agency to better serve the increased number of state workers in the downtown area as a result of the influx of more than 750 employees who were moved into Strawberry Square earlier this year. 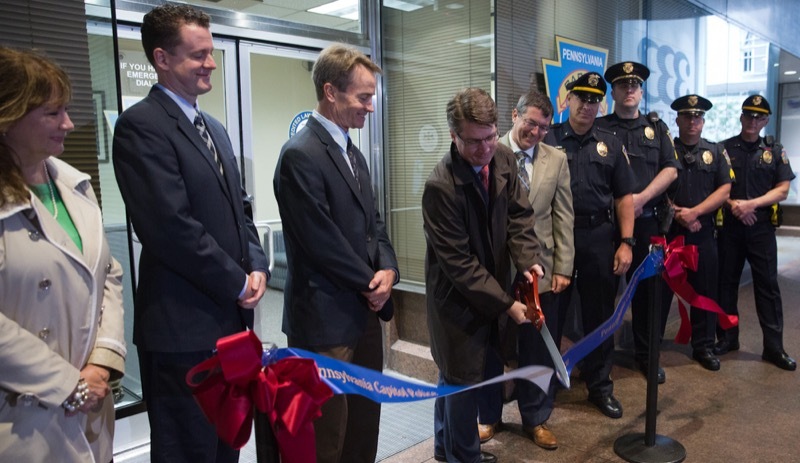 State Department of General Services Secretary Curt Topper and Pennsylvania Capitol Police Deputy Superintendent Kevin Brown were joined by Bradley Jones, CEO and President of Harristown Enterprises Inc., to officially open a new Pennsylvania Capitol Police Substation at 333 Market Street in Harrisburg. 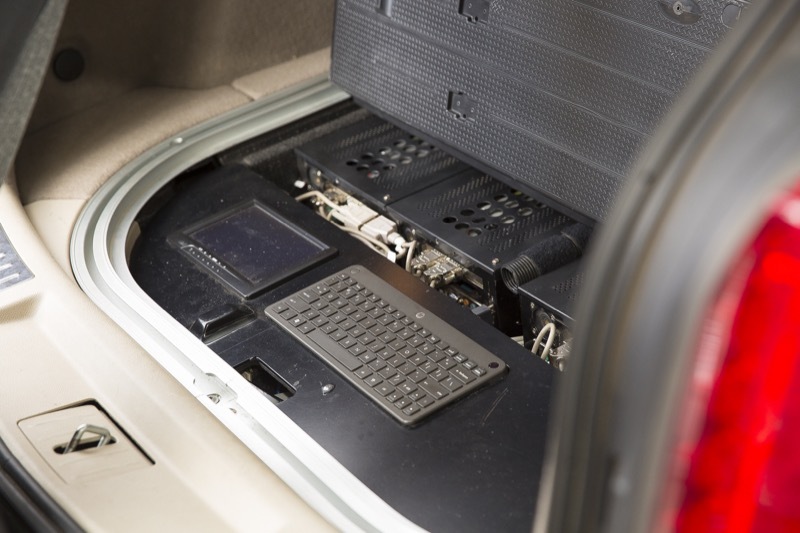 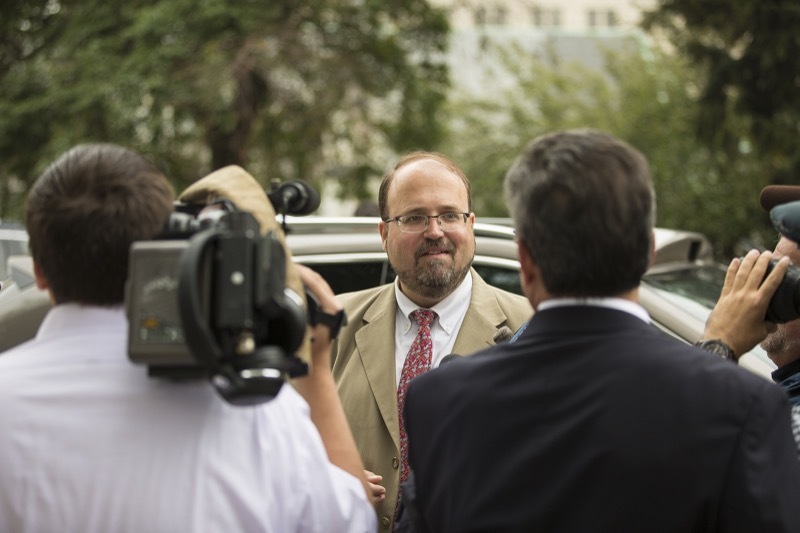 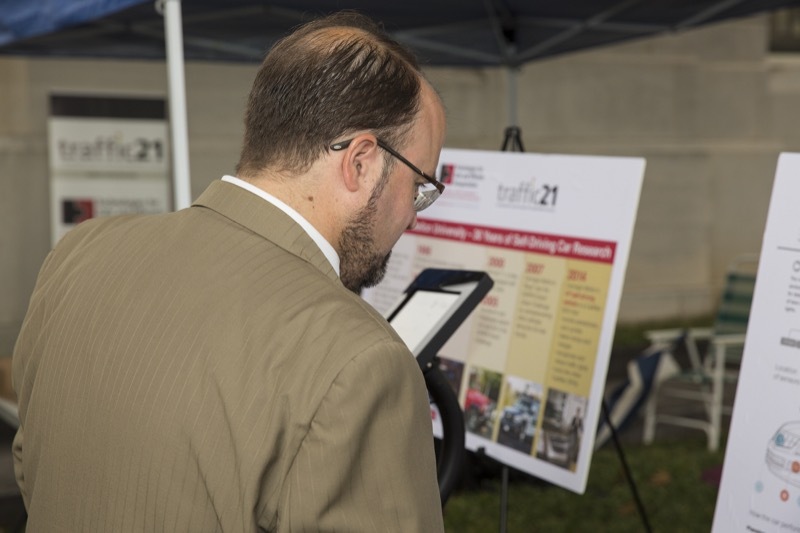 Harrisburg, PA - The Pennsylvania Department of Transportation (PennDOT), the City of Harrisburg, and Carnegie Mellon University (CMU) today highlighted safety and technology advances by conducting an Automated Vehicle demonstration at the Capitol in conjunction with the Pennsylvania Safety Symposium. 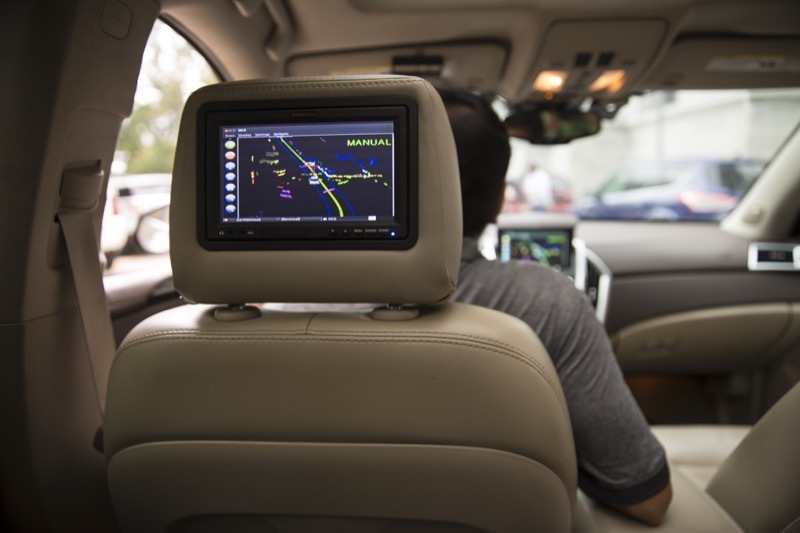 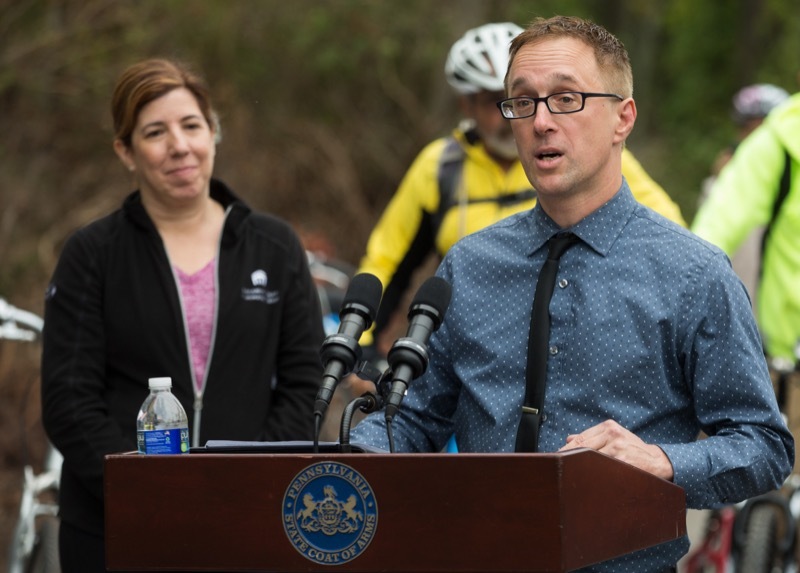 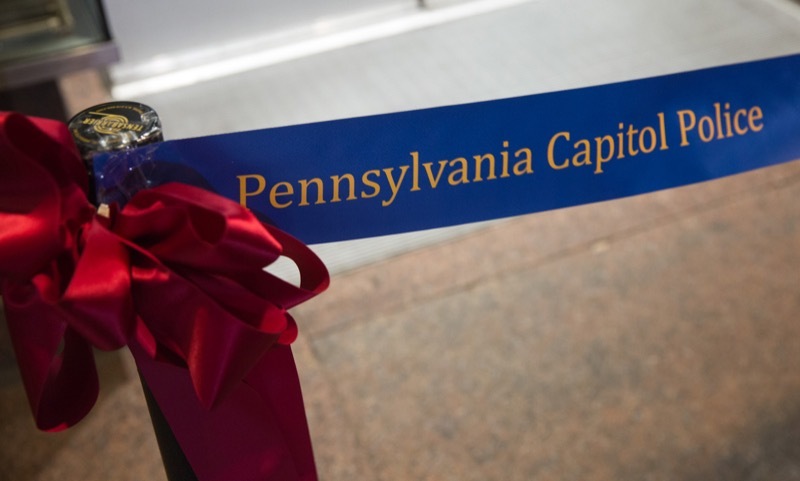 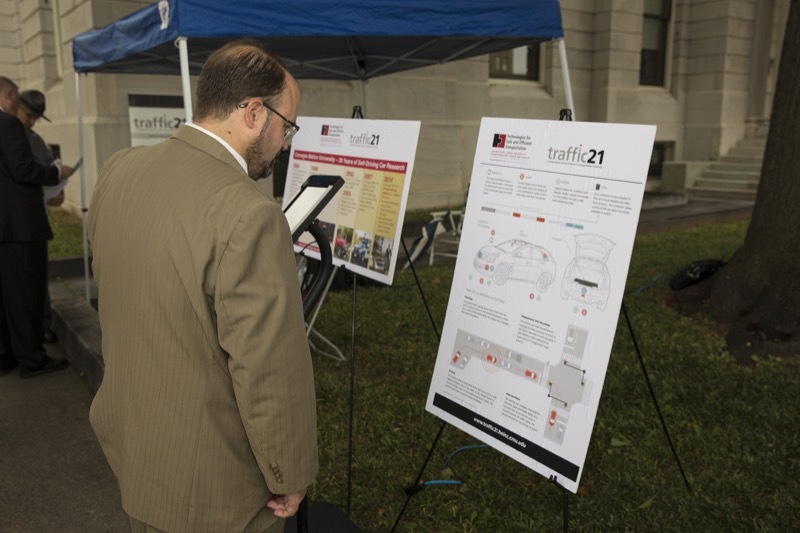 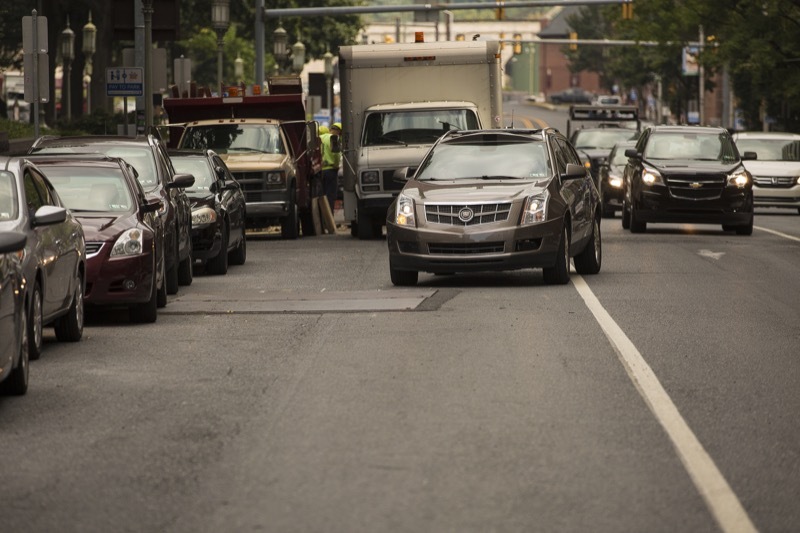 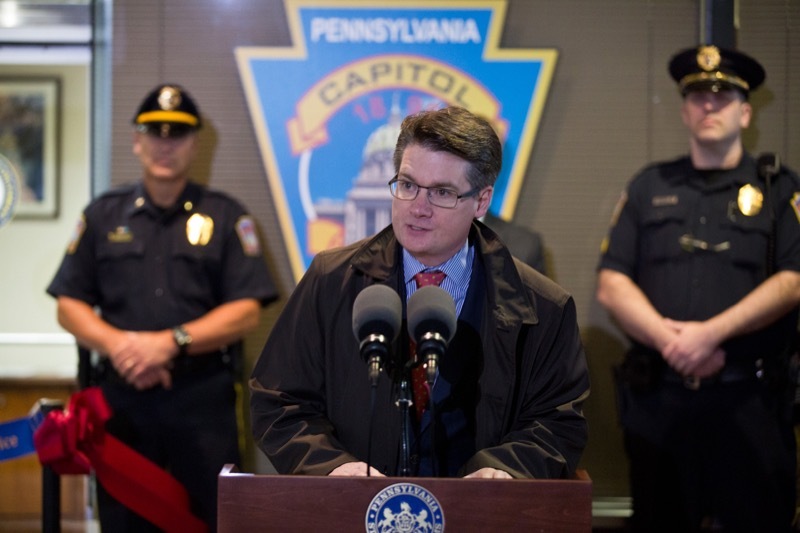 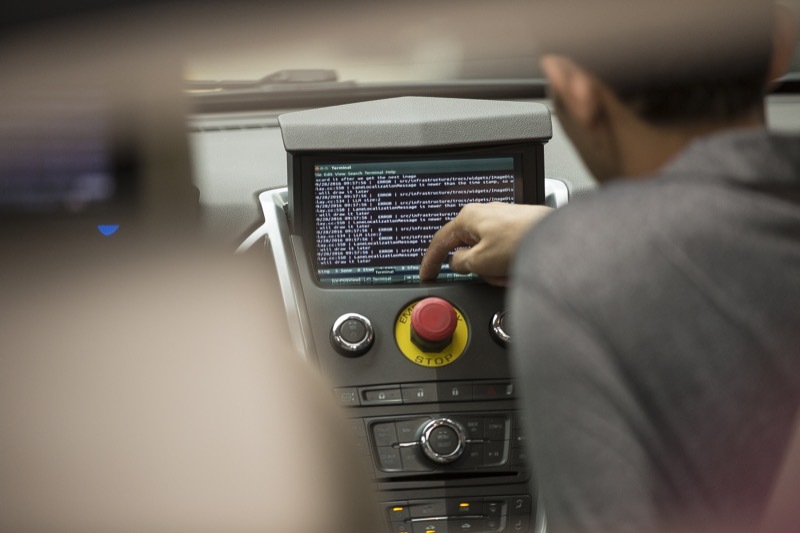 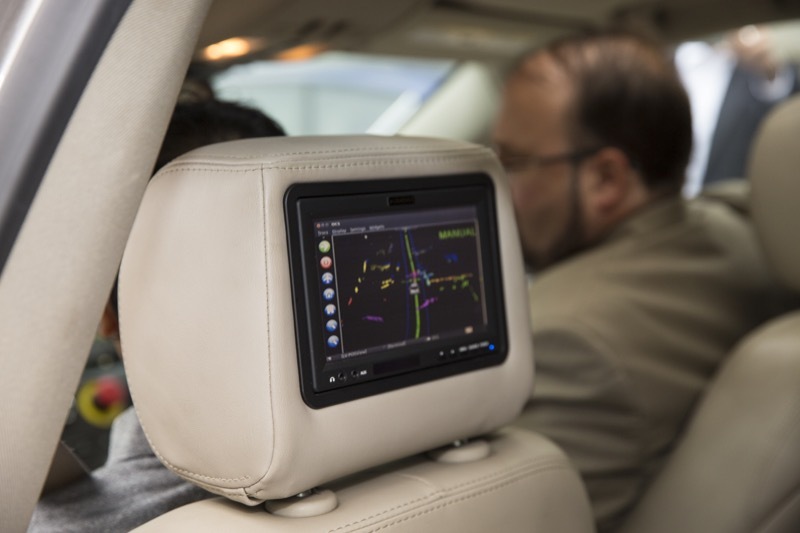 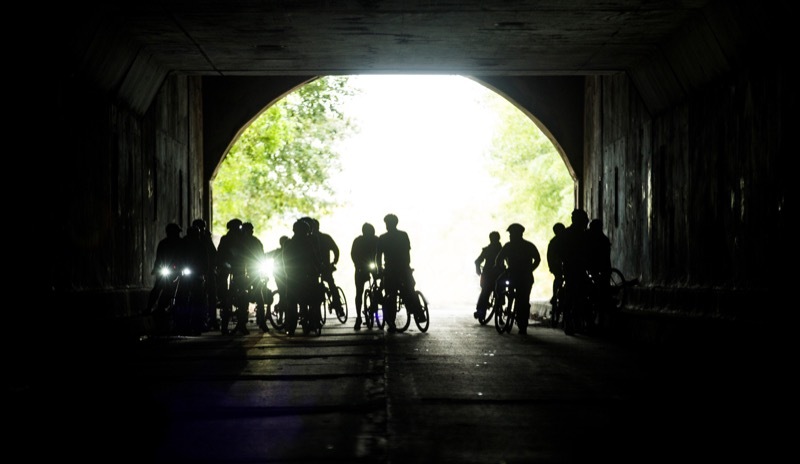 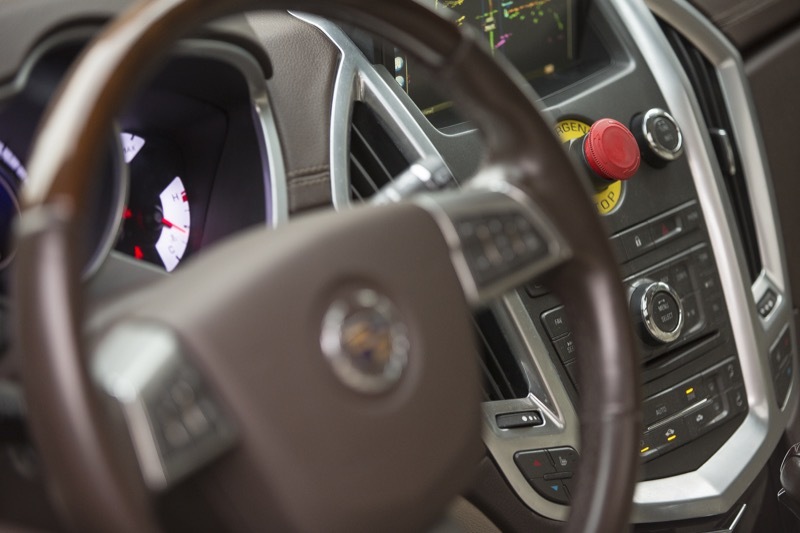 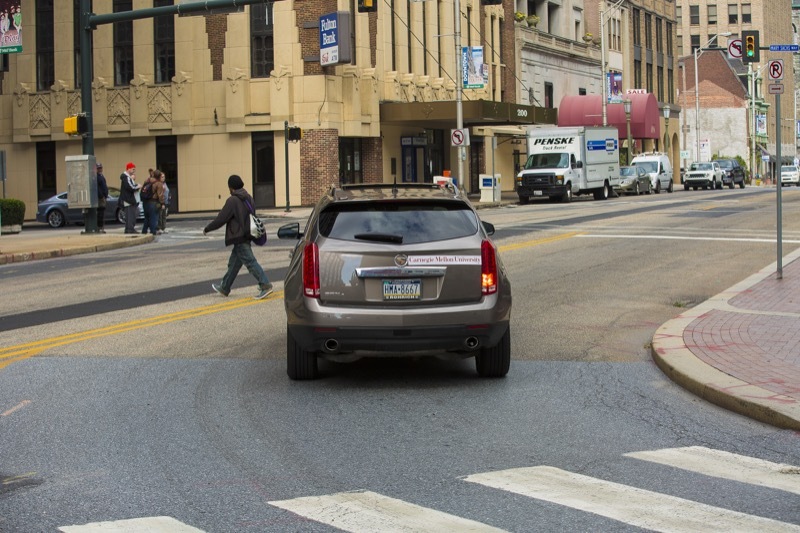 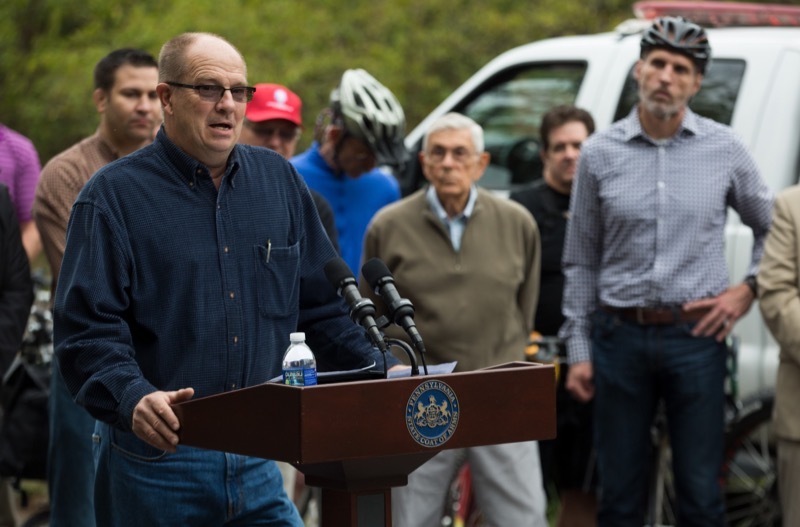 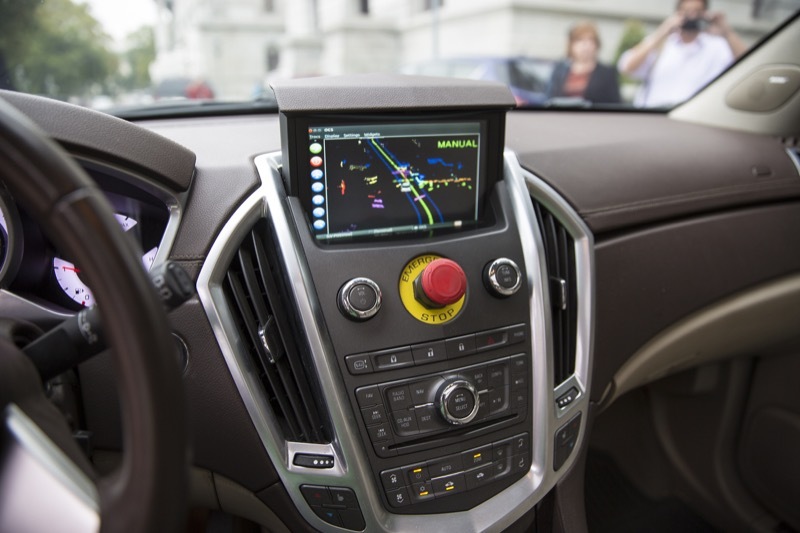 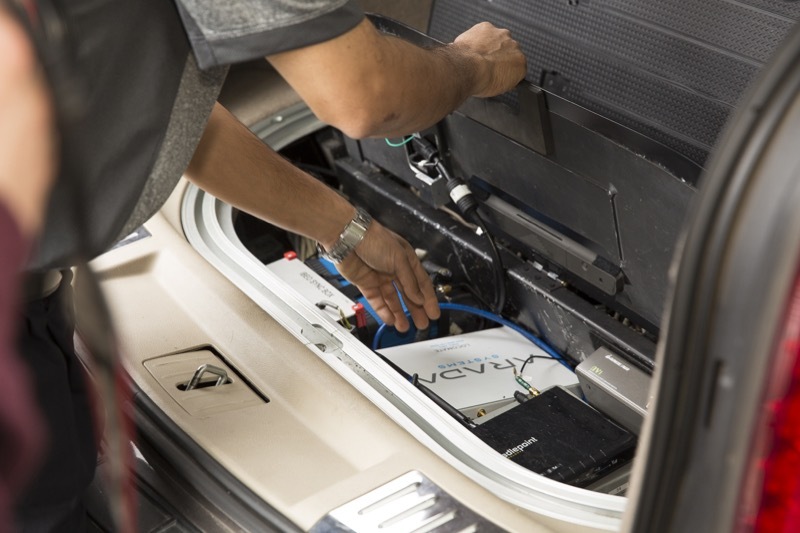 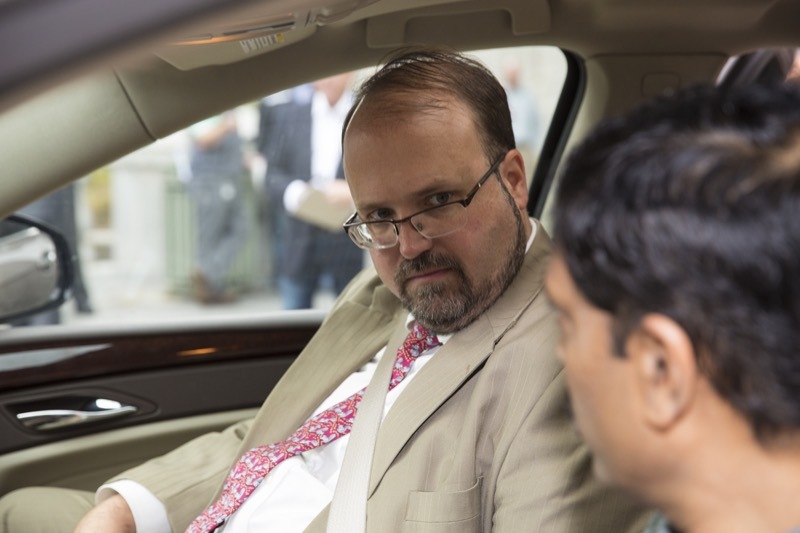 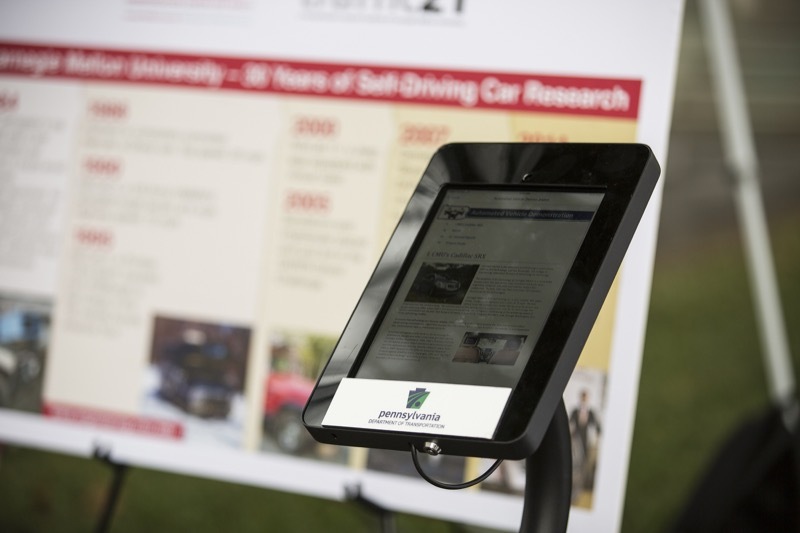 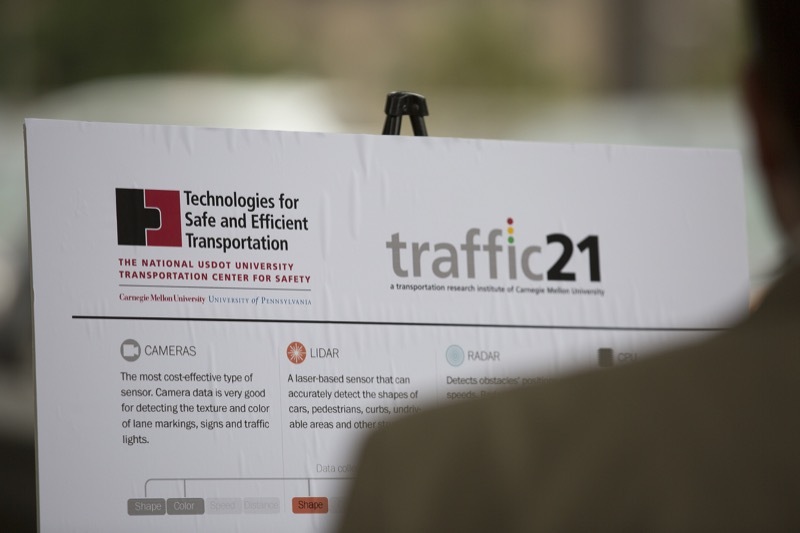 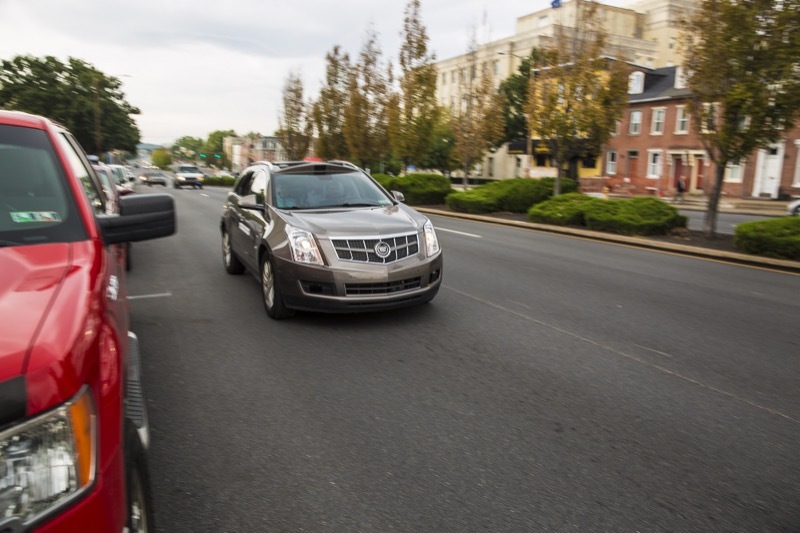 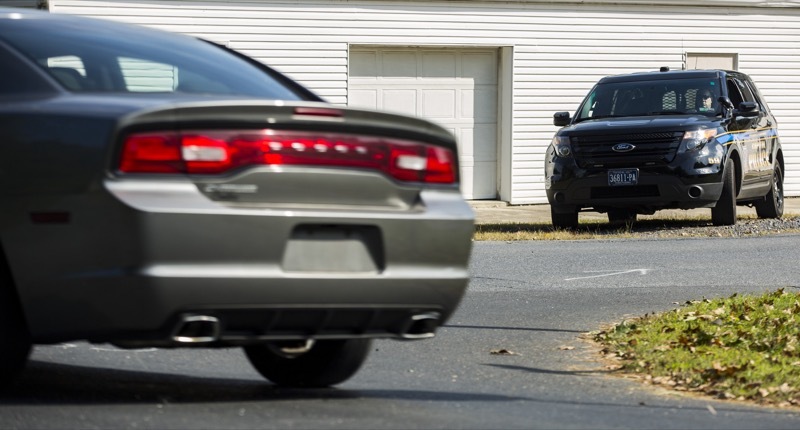 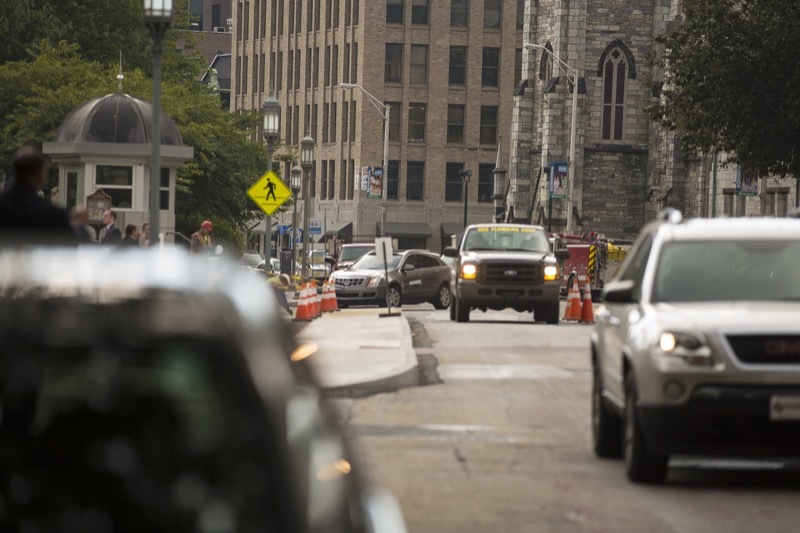 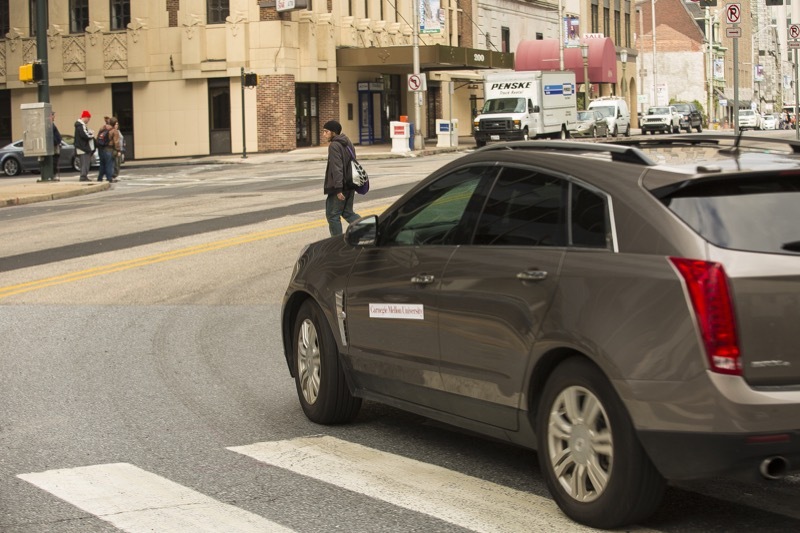 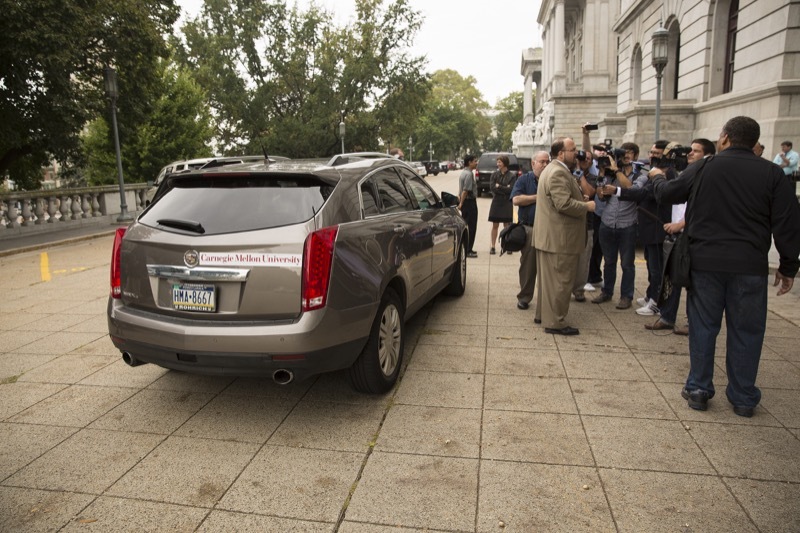 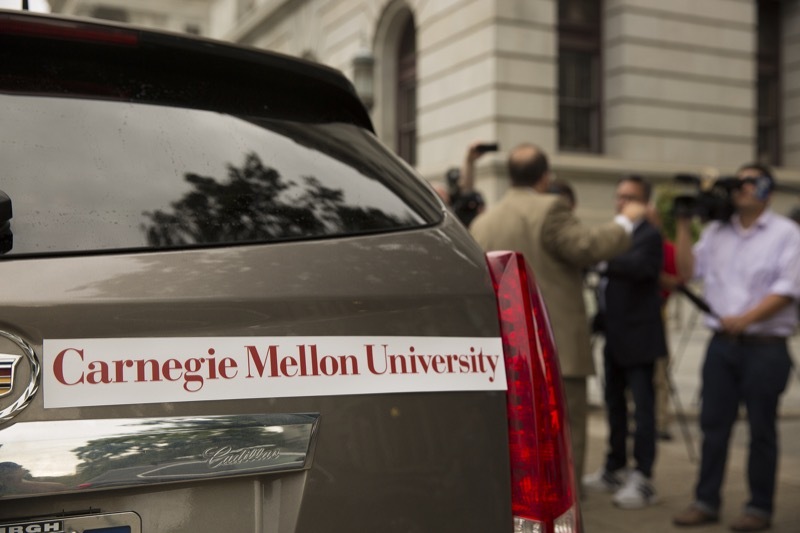 The Pennsylvania Department of Transportation (PennDOT), the City of Harrisburg, and Carnegie Mellon University (CMU) today highlighted safety and technology advances by conducting an Automated Vehicle demonstration at the Capitol in conjunction with the Pennsylvania Safety Symposium. 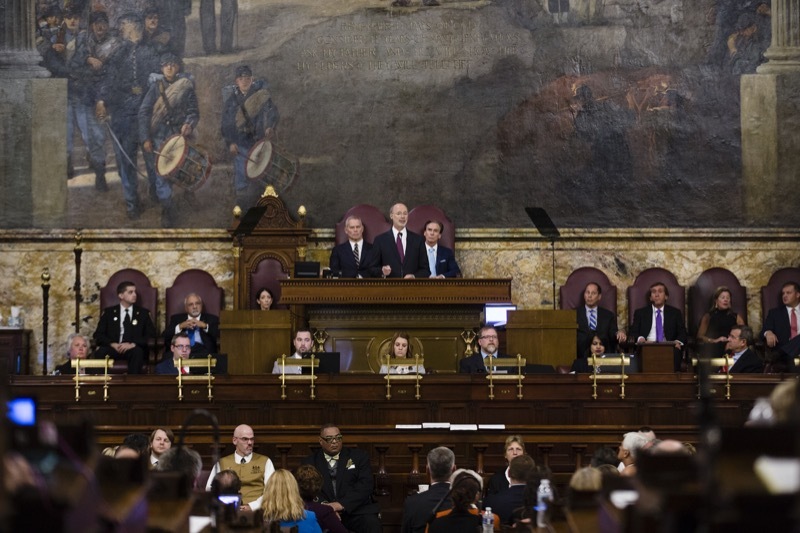 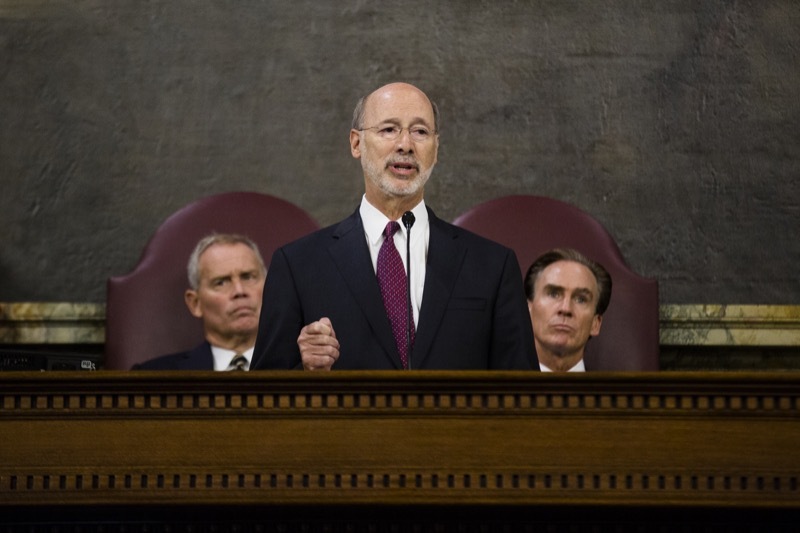 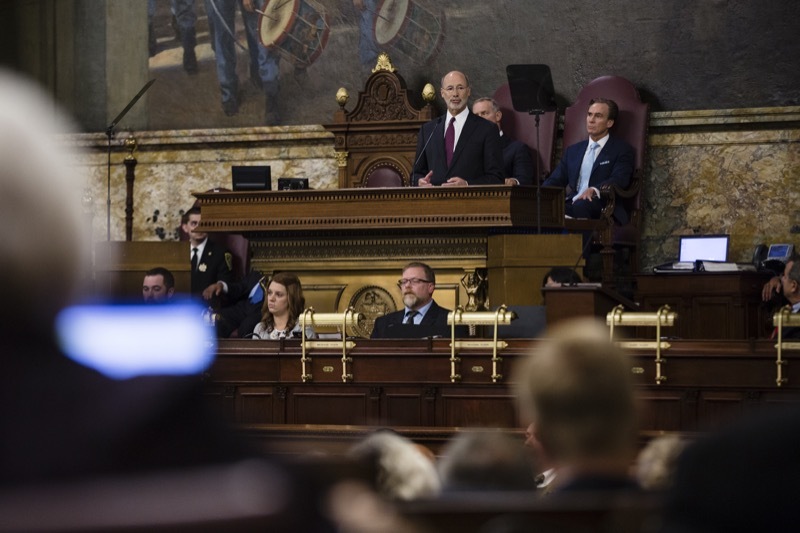 Governor Wolf addressed a Joint Session of the General Assembly to outline our collective plan to lead the nation in combatting the opioid and heroin crisis facing Pennsylvania. 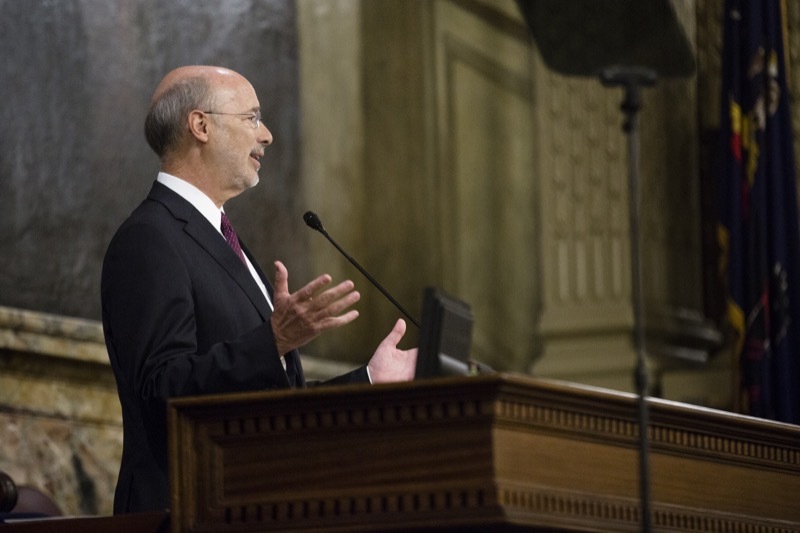 Click here to read Governor Wolf's remarks. 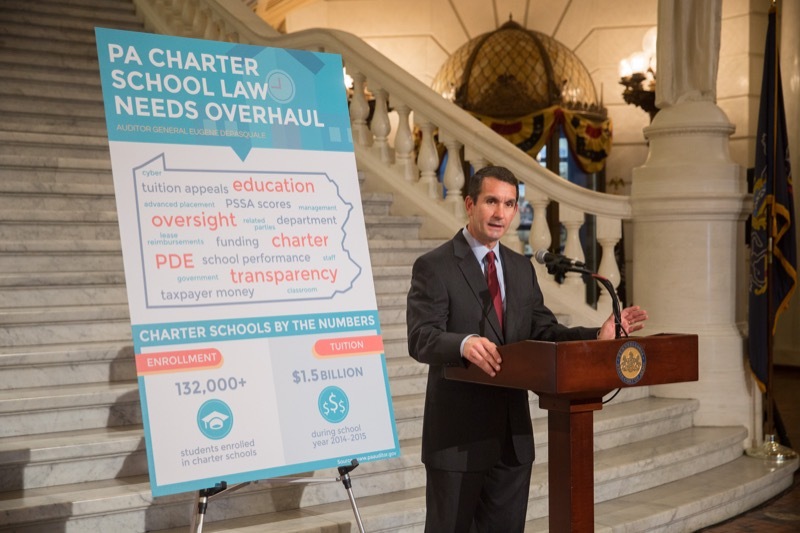 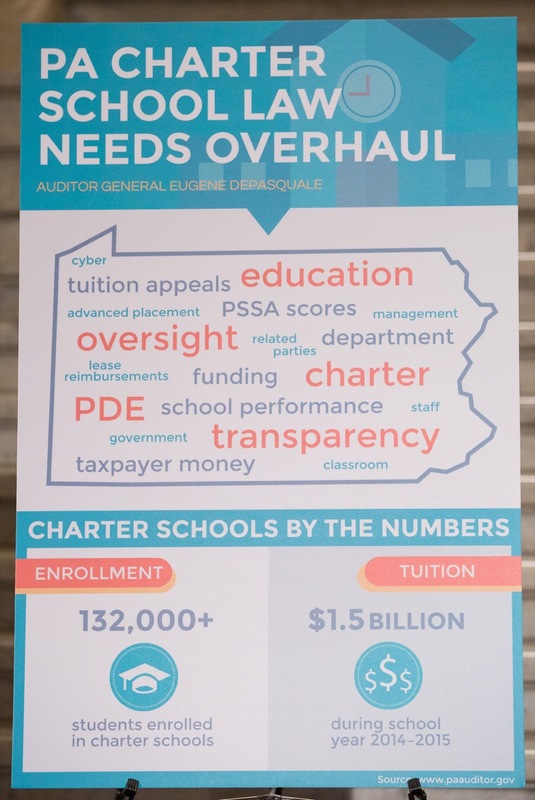 HARRISBURG - Auditor General Eugene DePasquale today said recent audits of Pennsylvania Cyber Charter School (PA Cyber), which enrolls students from 484 districts, and two related schools in Beaver County once again demonstrate the urgent need to overhaul the worst charter school law in the nation.